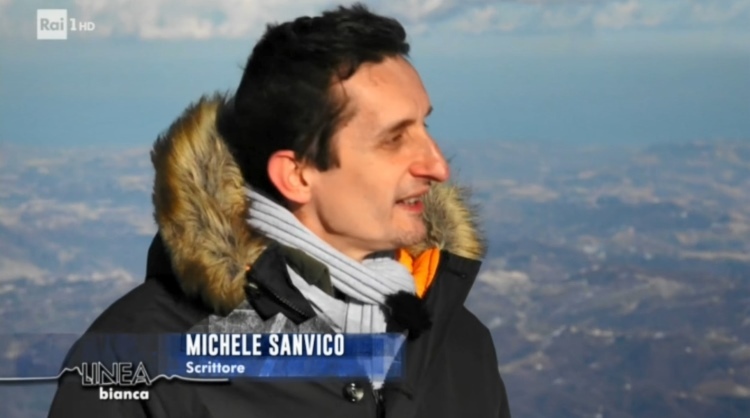 On the very peak of Mount Vettore, Massimiliano Ossini, presenter of the national TV series "The White Line" ("Linea Bianca"), produced by RAI1, interviews Italian writer Michele Sanvico on the legends of the Sibyl's cave and the Lakes of Pilatus, within the framework of the promotion of Italy's local territories as pursued by the State-owned national broadcaster, with the illustration to a wide audience of the artistic and cultural heritage present in the area of the Sibillini Mountain Range, a most charming setting in Italy. The Sibillini Mountain Range, set between the Italian provinces of Marche and Umbria, in which Mount Sibyl and Mount Vettore raise their peaks, make up a highly peculiar, truly fascinating territory, attracting increasing numbers of tourists owing to the astounding natural landscapes and a magical collection of legends which have been living in the area for many centuries. 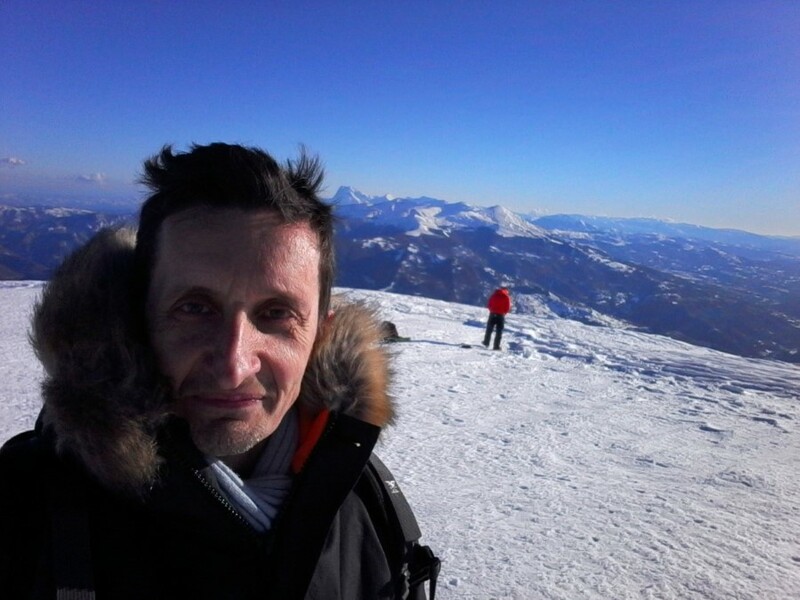 Sulla cima del Monte Vettore, Massimiliano Ossini, conduttore del programma "Linea Bianca", prodotto da RAI1, intervista lo scrittore Michele Sanvico sulle leggende della grotta della Sibilla e dei Laghi di Pilato, nel contesto degli obiettivi di promozione dei territori locali perseguiti dalla televisione pubblica, con illustrazione al grande pubblico delle ricchezze artistiche e culturali presenti nell'area dei Monti Sibillini, una delle zone più belle d'Italia. In particolare, i Monti Sibillini, posti tra le Marche e l'Umbria, e nel cui cuore si innalzano il Monte della Sibilla e il Monte Vettore, costituiscono un comprensorio unico e di grandissimo fascino, in grado di esercitare una significativa attrazione nei confronti dei flussi turistici grazie alle straordinarie bellezze naturali e alla magica stratificazione di leggende, che per secoli hanno abitato questi luoghi. The take-off from the landing area at Arquata del Tronto; the rise to Mount Vettore capped with snow; the fly-by over the mountain-top at an elevation of 8123 feet; the hovering over the gigantic glacial cirque; the astounding vista ranging from Mount Sibyl down to the Adriatic Sea; the vision of the mountain's amazing crests, the Peak of the Lake, the Peak of the Saviour, the Devil's Cliff; and then the breath-taking coming of the Great Plain, with its icy glittering under the sun; the landing on Mount Vettore; the RAI crew shooting on the mountain-top, under Massimiliano Ossini's lead, to record the footage required to make up the "Linea Bianca" TV show to be broadcasted on February 2nd 2019; and then back again to Arquata, the small town now razed to ground by a recent earthquake. 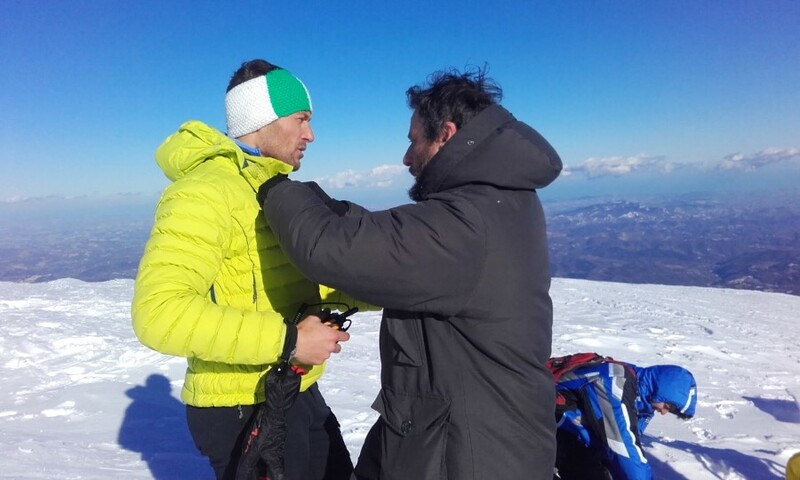 This is the footage shot on January 15th 2019 by Italian writer Michele Sanvico, who took part in the TV show as an expert of the sibilline legends. 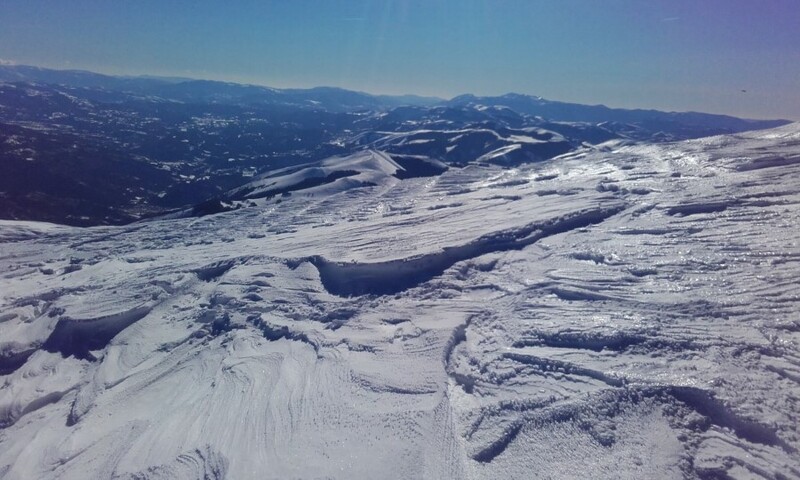 I Monti Sibillini visti dal cielo: in volo sul Monte Vettore con l'elicottero di RAI1 "Linea Bianca"
Il decollo dalla elisuperficie di Arquata del Tronto; la salita verso il Monte Vettore innevato; il passaggio sopra la cima, a 2476 m. di altitudine; il sorvolo del titanico circo glaciale; il panorama straordinario che spazia dal Monte della Sibilla fino al Mare Adriatico; la visione delle spettacolari creste della montagna, la Cima del Lago, la Cima del Redentore, il Pizzo del Diavolo; e poi l'apparizione, che toglie il fiato, del Pian Grande scintillante di sole e di ghiaccio; l'atterraggio sul Monte Vettore; le riprese della troupe RAI, guidata da Massimiliano Ossini, per la registrazione della puntata di "Linea Bianca" del 2 febbraio 2019; e poi il decollo e il ritorno verso Arquata, borgo tragicamente distrutto dal terremoto. Queste le immagini girate il 15 gennaio 2019 dallo scrittore Michele Sanvico, ospite della tramissione in qualità di esperto delle leggende sibilline. To have a role in the TV show "Linea Bianca" ("The White Line"), produced by the Italian national broadcaster RAI and presented by Massimiliano Ossini, is no different from being thrusted into a compelling action movie: people who scream "Go! Go! Go! 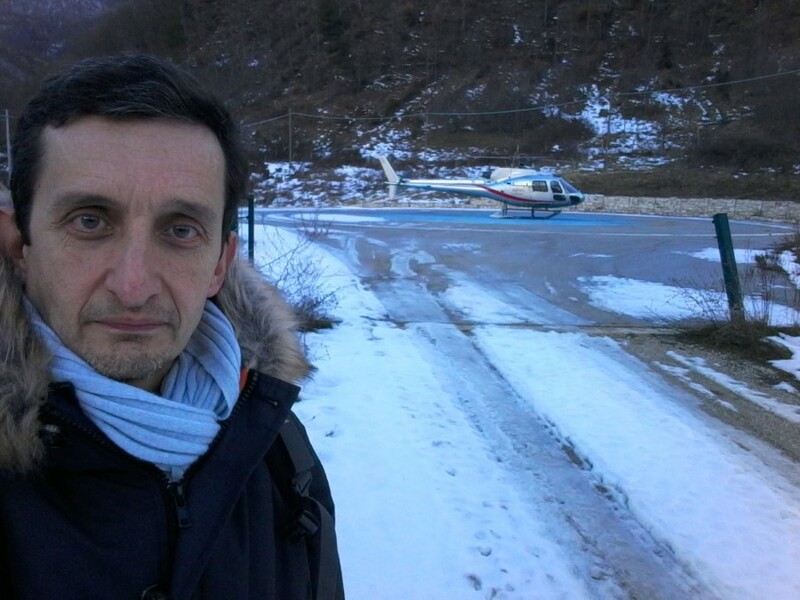 ", a frantic rush beneath the helicopter's rotating blades - one's head down - the engine which gains an ever increasing momentum, the runners that leave the surface of the small landing area at Arquata del Tronto, on the southern side of the Sibillini Mountain Range; and then up and up we go, by the precipitous side of Mount Vettore, with the helicopter leaving the shadowy gorge and raising upwards into the blue flooded by the white, stainless brilliance of the snow, never stopping its ascending motion, until it reaches the gradually-sloping plain on the mountain-top, a kingdom of pure icy snow, almost to the uppermost cross twisted by the might of the lightnings,and beneath a crystal-clear, cloudless sky down to the far-away Adriatic Sea, which shines with cyan hues in the blue radiance overwhelmed by the beams of the sun. 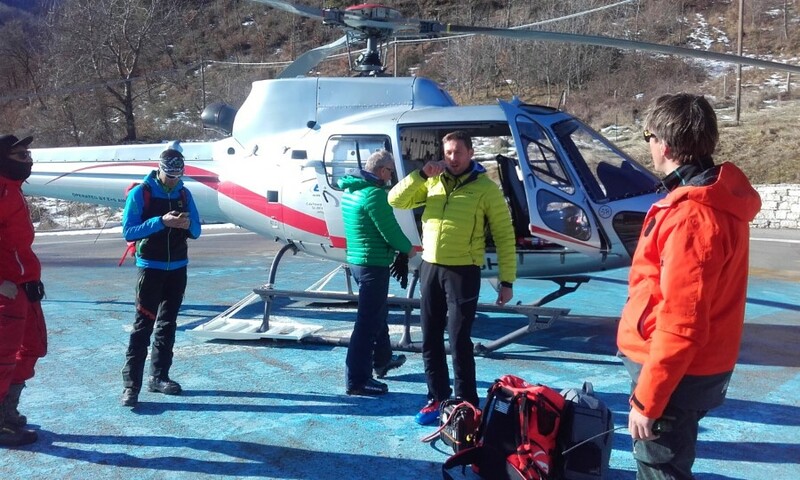 Up there, amid the glittering ice shaped by the freezing gusts of the wind, in a blinding solitude that plunges straight down on all sides, the action turns into a drawn, frantic activity, as the RAI professionals, led by Ossini, shoot the footage which is required to build up the TV episode, amid interviews, monologues, flights of drones, steadicams and mikes, to be accurately placed to shun the aggressive whistle of the wind. And then, at the presence of the Apennine Sibyl, whose peak stands out not far from there across the vertiginous ravine and the valley encircled by the same Mount Vettore, we start talking of that wondrous, legendary tale, and also of the legend of the Lakes of Pilatus, guarded within the glacial cirque of that gigantic mount capped with snow. And then again, away we go, as it is often seen in theatrical movies: the helicopter which comes, again, from the far horizon, the engine's humming noise turning into a deep roar; the landing on the mountain-top, amid sprays of snow scattered all around by the power of the great blades; we run, we get onboard, the rotating wings which never stop, for they cannot stop, they must not stop, lest balance and stability get disrupted; and so we leave, hovering over the incredibly elevated crests of Mount Vettore, and Beyond we gain a precious and unforgettable glimpse of Castelluccio and the Great Plain, an ocean which is of grass nomore, being now of dazzling, translucent ice, lit by the slant rays of the afternoon sun. And down we go at last, heading to our landing point, cruising through the dizzying emptiness that lays above the valley of the river Tronto. Just like in a movie, in a theater, in an adventure film. Yet this is no movie at all. Because, down there, we see the ruins of Arquata, with the tragic, moving vision of the arches that once, up to the night of August 24th 2016, supported the small village's buildings; a vision from above, with an almost vertical fly-by, which breaks our hearts. This is no movie, because Massimiliano Ossini and his highly-skilled crew came to Arquata, by the Sibillini Mountain Range, on purpose, to attest to the events that happened here: they intend to remind everybody that an earthquake took place, that these places and the people who live here must not be forgotten; and the promotion of the territory, on TV screens as well, is a way to contribute to a new birth, so that the spotlights may not be turned off on this dramatic events, and no one may ever forget. And I was struck by Massimiliano Ossini's astounding energy, a man who is always smiling and truly close to his men, a leader who, in the turn of a few hours, has led a complex arrangement of men and materials towards the predefined targets, by selecting sequences, shots and lines, handling with ease a number of interviews on a mountain-top, flying on a helicopter at least four times, and skiing loosely on ice down to the Lakes of Pilatus, and then moving to a different mountain altogether, and from there, from a peak belonging to the nearby Mounts of the Laga, sliding towards the bottom of a valley with a paraglider, not to forget a ride on a friend's motorbike along those amazing mountain roads. All that he made while he was leading his men by showing a manifest proficiency in leadership, with a remarkable prestige yet without losing in kindness and elegance, not even in the most tense occurrences, always coming when a TV production is filmed outdoor and in the roughest environmental conditions. A most charming experience it was, and a day of great significance for a territory that need people to talk and remember, not to be forgotten. With the aim to be allowed to head to their own renaissance, as soon as possible. Il racconto della Sibilla Appenninica dalla vetta più alta dei Monti Sibillini con il programma RAI "Linea Bianca"
Prendere parte al programma “Linea Bianca”, condotto da Massimiliano Ossini per RAI 1, è stato come essere catapultati all'interno di un film d'azione: le voci che gridano “Vai! Vai! 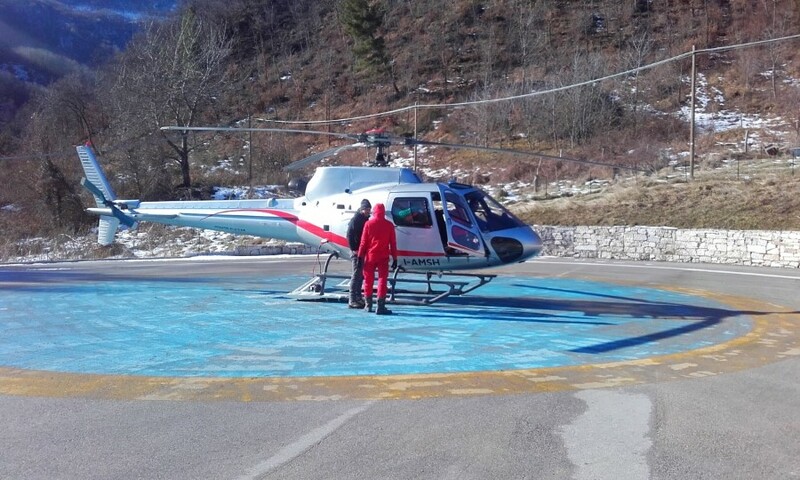 Vai!”, la corsa con la testa piegata sotto le pale roteanti dell'elicottero, il motore che prende progressivamente giri, i pattini che si staccano dalla piccola elisuperficie di Arquata del Tronto; e poi via su, sempre più su, lungo il fianco precipite del Monte Vettore, con l'elicottero che abbandona l'ombra della valle e si innalza nell'azzurro illuminato dal biancore accecante della neve, salendo senza mai fermarsi, oltre le creste sottili e arcuate della grande montagna, fino a raggiungere il pianoro leggermente inclinato della cima, regno di candido ghiaccio, sin quasi alla croce piegata dalla potenza del fulmine, sotto un cielo dal lucore cristallino, privo di nuvole fino al lontano Mare Adriatico, scintillante di blu nell'atmosfera azzurra inondata dai raggi del sole. Lassù, tra i cristalli ghiacciati modellati dalle raffiche gelide, in una solitudine abbagliante che discende da ogni lato verso un diverso abisso, l'attività si fa tesa e frenetica, mentre i professionisti della RAI, guidati da Ossini, effettuano le riprese necessarie alla costruzione della puntata, tra interviste, monologhi, voli del drone, steadycams, e microfoni da sistemare accuratamente per limitare l'opera demolitrice del vento. E poi, alla presenza della Sibilla, lontana, ma ben visibile oltre lo strapiombo vertiginoso e la vallata che il Monte Vettore stesso racchiude, si parla di quel fantastico racconto leggendario, e della leggenda dei Laghi di Pilato, custoditi nella conca glaciale di quella titanica montagna innevata. 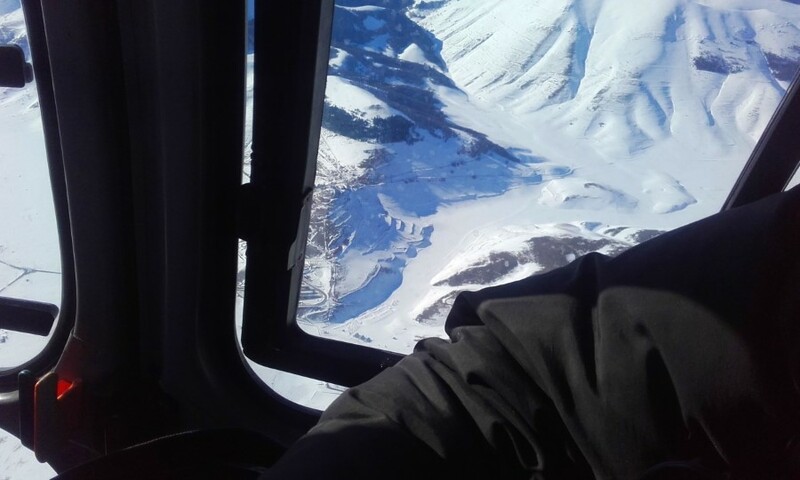 E infine, via di nuovo, come si vede fare al cinema: l'elicottero che giunge, nuovamente, da lontano, il ronzio del motore che diviene un rombo sempre più intenso; l'atterraggio sulla vetta, tra gli spruzzi della neve scagliati tutt'attorno dalla potenza della grande elica; la corsa, la salita, le pale che continuano a girare, perché non possono, non devono fermarsi, per non rischiare di perdere stabilità e assetto; e poi via, girando attorno alle creste altissime del Monte Vettore, guadagnando una visione preziosa e indimenticabile di Castelluccio e del Pian Grande, oceano non più d'erba ma di ghiaccio rilucente, abbacinante, illuminato dai raggi radenti del sole pomeridiano. E infine giù, verso la base, sospesi nell'aria, solcando ancora il vuoto vertiginoso al di sopra della valle del Tronto. Come in una pellicola, come al cinema, come in un film. Ma non è affatto un film. Perché, lì sotto, ci sono le macerie di Arquata, con la visione tragica, struggente degli archi che, fino alla notte del 24 agosto 2016, sorreggevano le case del borgo; e vederle da quassù, volandoci sopra quasi in verticale, è un'immagine che fa piangere il cuore. Non si tratta affatto di un film, perché Massimiliano Ossini e la sua validissima, preparatissima troupe sono venuti apposta qui, ad Arquata, sui Monti Sibillini, per rendere ancora testimonianza di quanto è successo: per ricordare a tutti che il terremoto c'è stato, che non bisogna dimenticare questi luoghi, questa gente; e che promuovere queste terre, anche in televisione, significa contribuire alla loro rinascita, affinché non si spengano i riflettori su questa drammatica vicenda, perché nessuno possa dimenticare. 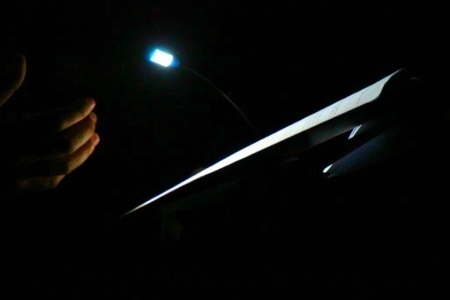 E mi ha colpito la grande energia di Ossini, persona sorridente e alla mano, che, in poche ore, è stata in grado di condurre verso gli obiettivi prefissati una complessa macchina organizzativa, decidendo sequenze, inquadrature e testi, gestendo con disinvoltura varie interviste ad alta quota, effettuando almeno quattro voli in elicottero, sciando con tranquillità sul ghiaccio fin quasi ai Laghi di Pilato, per poi cambiare montagna e, da lì, dai prospicienti Monti della Laga, planare verso il fondovalle in parapendio, non senza avere in precedenza inforcato la moto di un amico del luogo ed essersi cimentato con quel potente mezzo, in una pausa delle riprese, lungo quelle meravigliose strade di montagna. Il tutto guidando i suoi uomini con evidenti doti di leadeship, con autorevolezza ma senza mai perdere in gentilezza e signorilità, nemmeno nei momenti di maggior tensione, sempre presenti quando si realizzano produzioni in esterni e in condizioni così particolarmente proibitive. Una bellissima esperienza, dunque, e una giornata di grande importanza per un territorio che ha bisogno di far parlare di sé, per non essere dimenticato. Per potere essere messo in condizioni di rinascere, al più presto. 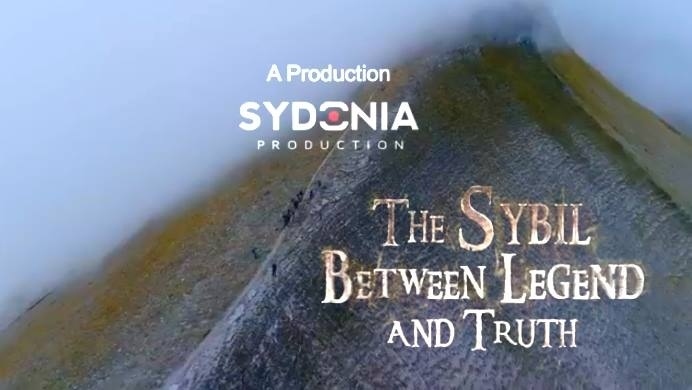 Sydonia Production, a professional motion picture producing company with international reach and presence, is releasing its new documentary "The Sibyl - Between Legend and Truth" with a preview that will take place on 19 Dec 2018 in Fermo (Italy). With this remarkable docufiction, a professional product developed with the aid of advanced filming technologies for distribution by SKY Arte in Italy and in English for the worldwide audiovisual market, a new interest for the Apennine Sibyl's legend is starting to spread around the world, both from a historical, cultural and literary points of view, and as a potential development factor for tourism in a land which has been hardly hit by a recent earthquake sequence. The first documentary ever made on the mith of the Apennine Sibyl, directed by Luca Trovellesi Cesana, will be shown to a public audience during the preview, an exclusive and invitation-only event, to be held in Fermo next Wednesday. The preview will be attended by the Sydonia Production's team and the many professionals, actors, scholars and historians who took part in the production of the movie, including Italian writer Michele Sanvico, a most informed authority in the eerie legend of the Apennine Sibyl. Sydonia Production, la casa di produzione cinematografica con sede nelle Marche e consolidata presenza nei mercati internazionali, presenta il nuovo documentario “La Sibilla tra Realtà e Leggenda”, il giorno 19 dicembre 2018, alle ore 21.00, a Fermo (FM). Con questa grande docufiction, una produzione professionale realizzata con tecniche e metodologie avanzatissime, destinata alla distribuzione in Italia tramite SKY Arte e in lingua inglese nel mercato internazionale dell'audiovisivo, si conferma il rinnovato interesse verso il mito della Sibilla degli Appennini, sia da un punto di vista storico, culturale e letterario, sia anche come fattore di sviluppo, anche turistico, in un territorio gravemente colpito dal recente terremoto. Il primo documentario mai realizzato sulla leggenda della Sibilla Appenninica, diretto dal regista Luca Trovellesi Cesana, sarà proiettato per la prima volta al pubblico in occasione dell'anteprima esclusiva e a invito che si terrà a Fermo mercoledì prossimo, alla presenza della produzione Sydonia e dei numerosi tecnici, attori, ricercatori e storici che hanno partecipato a vario titolo alla produzione del film, tra i quali anche lo scrittore Michele Sanvico, esperto conoscitore della leggenda sibillina. 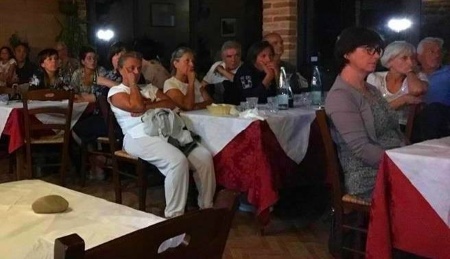 Audience enchained and faces enthralled by the narration of facts and findings related to the legend of the Apennine Sibyl: this is what happened last Saturday, August 18 2018 in the most beautiful setting of the Agriturismo Santa Lucia dei Sibillini in Monterfortino. With a compelling narrative, and this year with previously unpublished discoveries never proposed to audiences in the past, Italian writer Michele Sanvico led the attendees through the enigmas and mysteries of the Sibyl of the Apennines, from "Guerrino the Wretch" to Antoine de la Sale, from Tannhäuser to the excavations performed on the Sibyl's mountain-top, and across the most romantic aspects - but also the darkest and most sinister - of this lore, up to the preview of the professional docufiction currently being filmed by a renowned audiovisual production firm and specifically dedicated to the antique and illustrious legend that tells the tale of the prophetess of the Sibillini Mountain Range. 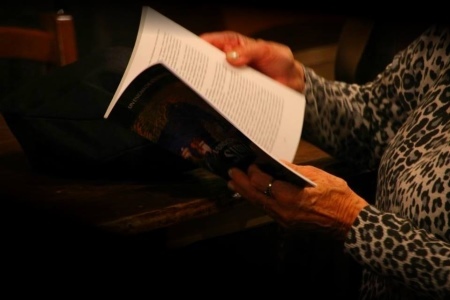 With spectacular images and stunning footage, the audience has progressed through a narrative which has cast its spell, in past centuries, on travellers and scientists, poets and men of letters, coming from all over Europe in search of the secret of a Sibyl. During the session, for the first time ever the outcomes of the research currently being carried out by the same author Michele Sanvico have been presented to the public, with reference to fifteenth- and sixteenth-century books and manuscripts which are even older, casting in this way a new light, never seen before, on the mystery of the Apennine Sibyl. 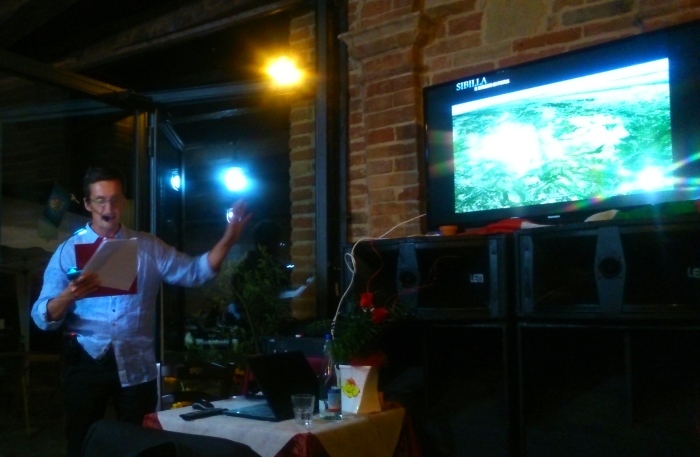 A few preliminary conclusions were illustrated to the people who attended the thrilling event, stirring fresh new interest and additional crave for more insight on this exciting enigma. 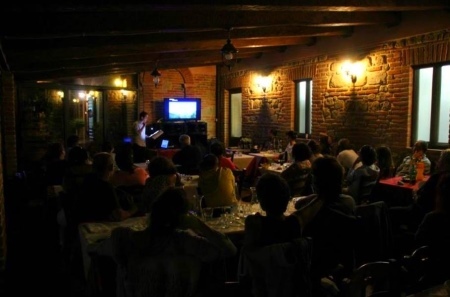 The presentation was preceded by the tasty, toothsome dinner arranged by the experienced hands of chef Marco Molinari, with the use of natural food - flour, meat, vegetables - all coming from the family's farmhouse, making up the base of the traditional dishes of the cuisine of the Marche region as offered by the delicious restaurant of the Agriturismo. 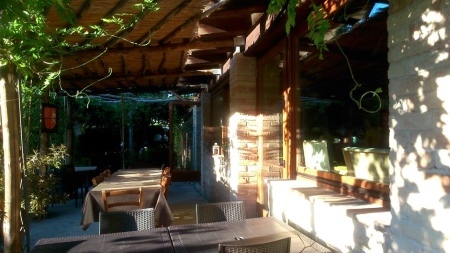 A special acknowledgement to Bernardina Agasucci and Francesco Molinari, the heart and soul of the Agriturismo Santa Lucia dei Sibillini, for their warm, greathearted hospitality which makes visitors - and writers - feel as if they were at home (but with a much more refined cooking!). A grateful thank, as always, to Federico Rossi and Nicoletta Scopa, fully committed to bringing new life to a territory that has been hardly hit by the earthquakes, with the indefatigable promotion carried out on-field with their www.sibilliniweb.it website, and with innovative businesses such as "The Lavender of the Sibillini in Montegallo", in a successful effort to revitalize the area, conduct territorial marketing and encourage new touristic flows. Additional thanks to Francesco for having brought us, with his mighty four-wheel-drive, up to Mount Sibyl, following ten years of absence: an emotional feeling that, on the true site, floods our hearts in a way that is much more deep, magical and unique. 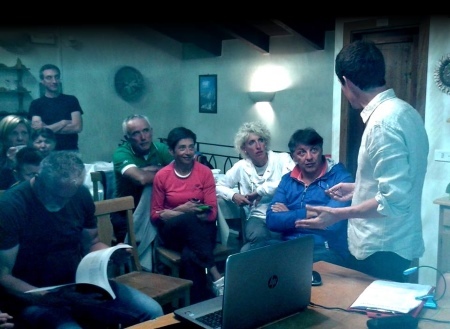 Pubblico incatenato e volti affascinati dalla narrazione dei fatti e delle scoperte connessi alla leggenda della Sibilla Appenninica lo scorso sabato 18 agosto 2018, nella meravigliosa cornice dell'Agriturismo Santa Lucia dei Sibillini a Monterfortino. Con il ritmo incalzante di sempre, ma quest'anno con rivelazioni inedite e mai rese pubbliche in precedenza, lo scrittore Michele Sanvico ha condotto i presenti attraverso gli enigmi e i misteri della Sibilla degli Appennini, dal "Guerrin Meschino" ad Antoine de la Sale, da Tannhäuser agli scavi sulla cima del Monte Sibilla, attraverso gli aspetti più romantici ma anche più oscuri ed inquietanti di questa tradizione, fino ad arrivare all'anteprima della grande docufiction che sarà realizzata da una nota casa di produzione televisiva proprio sulla grande e antica leggenda che racconta della profetessa dei Monti Sibillini. Con immagini spettacolari e filmati di grande impatto, il pubblico ha potuto seguire l'evolversi di un racconto che ha affascinato, nei secoli passati, viaggiatori e scienziati, poeti e letterati, provenienti da tutta Europa, in cerca del segreto della Sibilla. 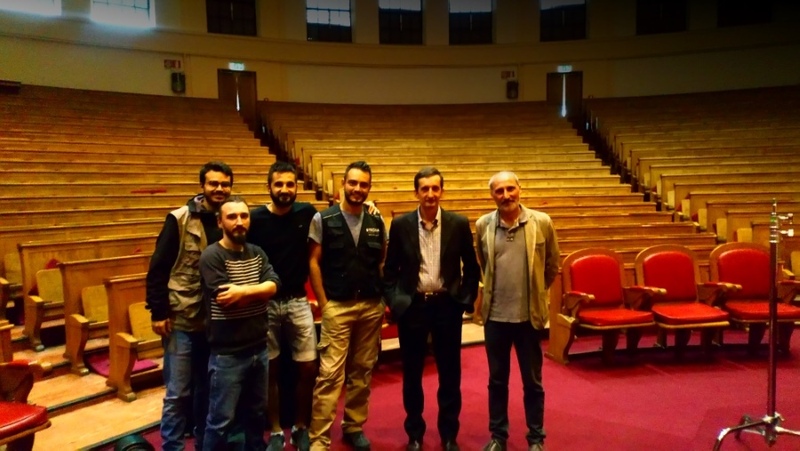 Nel corso della presentazione, sono stati presentati, per la prima volta, i risultati delle ricerche attualmente condotte dallo stesso scrittore Michele Sanvico su testi quattrocenteschi e cinquecenteschi, nonché su manoscritti ancora più antichi, in grado di gettare una luce nuova, mai evidenziata in precedenza, sull'enigma della Sibilla Appenninica. Alcune conclusioni preliminari, supportate da evidenze letterarie ed iconografiche, sono state presentate al pubblico che ha preso parte all'emozionante serata, suscitando ulteriore interesse e desiderio di approfondire ancora questo appassionante mistero. La presentazione è stata preceduta dalla gustosa, saporitissima cena preparata con mani sapienti dallo chef Marco Molinari, con genuine materie prime - farine, carni e ortaggi - tutte provenienti dall'azienda agricola di famiglia, le quali formano la base dei piatti tipici della cucina marchigiana offerti dal delizioso ristorante dell'Agriturismo. 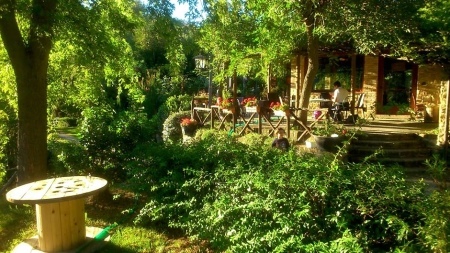 Un ringraziamento particolare a Bernardina Agasucci e Francesco Molinari, anima e cuore dell'Agriturismo Santa Lucia dei Sibillini, per la loro generosissima e cordialissima ospitalità, in grado di far sentire ogni visitatore, e ogni scrittore, come a casa propria (ma con una cucina ben più sopraffina!). Grazie, come sempre, a Federico Rossi e Nicoletta Scopa, impegnati nel dare nuova vita al difficile post-terremoto dei Monti Sibillini grazie all'infaticabile promozione condotta sul campo con www.sibilliniweb.it, e con innovative iniziative imprenditoriali come "La Lavanda dei Sibillini di Montegallo", in grado di rivitalizzare il territorio, fare marketing e creare nuovi flussi turistici. Grazie anche a Francesco per averci accompagnato, con il suo poderoso 4x4, fino al Monte della Sibilla, dopo ben dieci anni di assenza: un'emozione che, dal vero, si manifesta in modo ancora più intenso, magico e speciale. 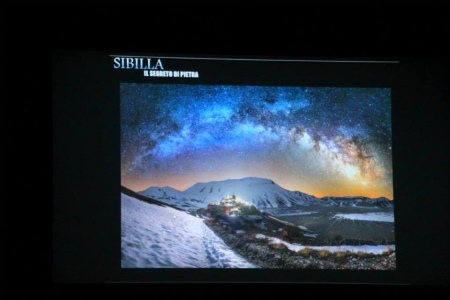 In the gorgeous scenery of Astorara, Montegallo (Italy), right beneath the most frightful slopes of Mount Vettore, the highest mountain in the Sibillini Mountain Range, an evening dedicated to the legend of the Apennine Sibyl took place on Friday August, 17 2018, with the tale told by Italian writer Michele Sanvico. 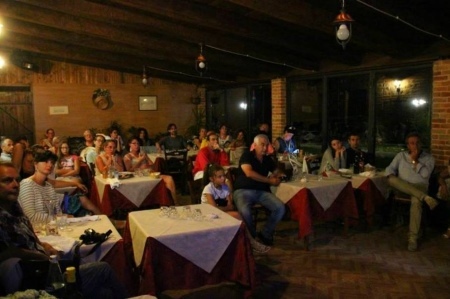 In the brave, charming "Rifugio Agrimusicismo Cantantonella", established just after the great earthquake in 2016 and dedicated to the late singer Antonella Zarletti, the author and his audience have enjoyed more than a hour and twenty minutes of compelling narrative, during which, just as if in a movie, spectacular images and previously unreleased footage have plunged the attendees into the mysterious, enthralling world of the Sibyl of the Apennines, from Guerrino the Wretch to Antoine de la Sale, from Tannhäuser to the excavations performed on the Sibyl's mountain-top, and up to the most recent outcomes of the research which is being carried out by Italian writer Michele Sanvico himself on ancient books and manuscripts that are linked to this fascinating legend. Amid the audience including lovers of the legendary tale and people who are interested in gaining more insight on this myth so relevant for this beautiful Italian region, we were honored to welcome His Excellency Monsignor Giovanni D'Ercole, Bishop of Ascoli Piceno, who was in Montegallo for His official visit lasting from August, 15 to 23, in a land which is so magnificent but also so hardly hit by earthquakes. A special acknowledgement is made to Federico Rossi and Nicoletta Scopa, unflagging managers of the "SibilliniWeb" website and scented entrepreneurs with "The Lavender of the Sibillini in Montegallo", and to Mario Alessandri, manager of the "Rifugio Agrimusicismo Cantantonella", a man with a great heart and an experienced singer, who is carrying on, with commitment and full personal engagement, the project that was conceived in partnership with Antonella Zarletti, who passed unfortunately away a year ago. 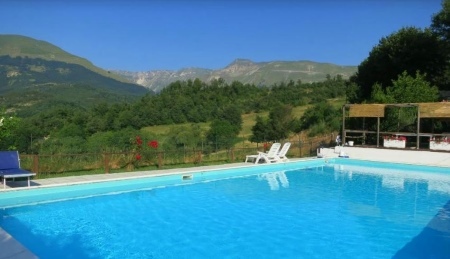 A project for life whose offspring is beauty, hospitality and well-being, in a most magical and stunning area of the Sibillini Mountain Range. Nello strepitoso scenario di Frazione Astorara, a Montegallo (AP). 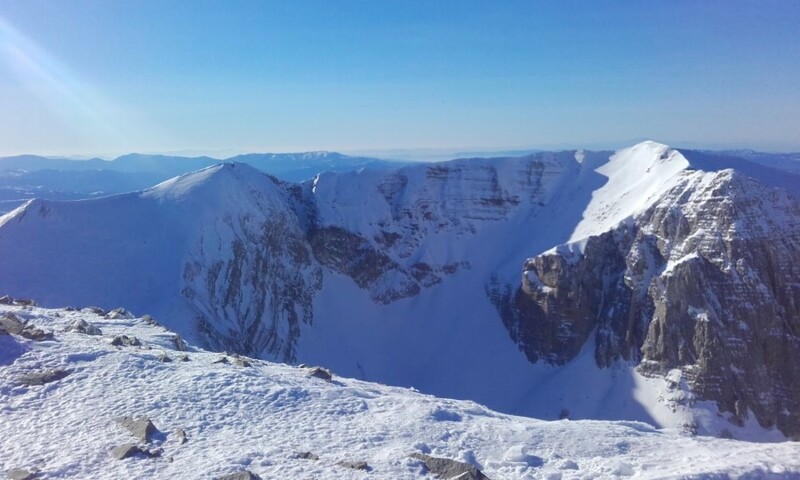 proprio al di sotto dei versanti più spettacolari del Monte Vettore, la cima più elevata dei Monti Sibillini, venerdì 17 agosto 2018 ha avuto luogo la serata dedicata alla leggenda della Sibilla Appenninica, raccontata dallo scrittore Michele Sanvico. 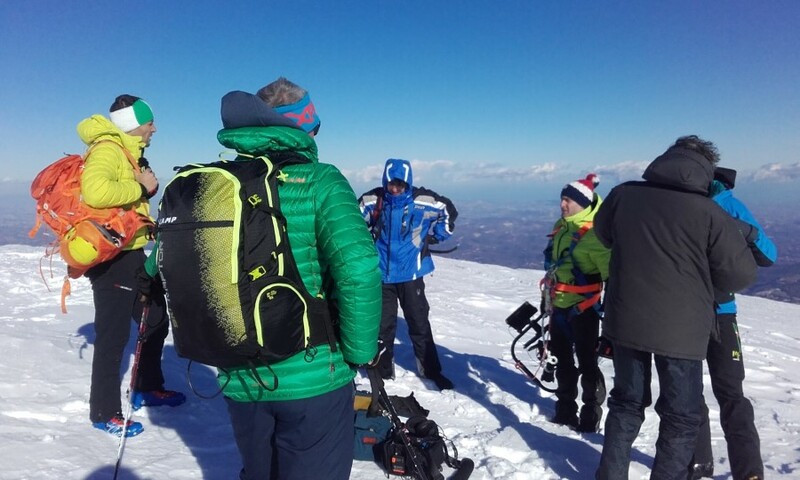 Ospiti della coraggiosa e deliziosa struttura "Rifugio Agrimusicismo Cantantonella", nata subito dopo il terremoto del 2016 e dedicata alla scomparsa cantante Antonella Zarletti, autore e pubblico hanno potuto vivere assieme oltre un'ora e venti di serrata narrazione, nel corso della quale, come in un film, le spettacolari immagini e gli inediti filmati proiettati su schermo hanno permesso ai presenti di immergersi totalmente nell'atmosfera misteriosa ed entusiasmante del mondo della Sibilla, da Guerrin Meschino ad Antoine de la Sale, da Tannhäuser agli scavi sulla cima del Monte Sibilla, fino ai più recenti risultati della ricerca portata avanti dallo stesso scrittore Michele Sanvico sugli antichi testi e manoscritti che si pongono in relazione con questa affascinante leggenda. Tra il pubblico di appassionati e persone interessate ad approfondire la storia di questo mito così importante per il territorio, ha voluto onorarci della Sua presenza anche S.E. Monsignor Giovanni D'Ercole, Vescovo della Diocesi di Ascoli Piceno, presente in Montegallo in occasione della visita pastorale in corso di svolgimento, tra il 15 e il 23 agosto, presso queste terre meravigliose, così duramente colpite dal terremoto. Uno speciale ringraziamento è rivolto a Federico Rossi e Nicoletta Scopa, infaticabili organizzatori di SibilliniWeb e profumatissimi imprenditori impegnati con "La Lavanda dei Sibillini di Montegallo", e a Mario Alessandri, gestore del "Rifugio Agrimusicismo Cantantonella", uomo dal cuore grande ed espertissimo cantante, il quale sta portando avanti, con dedizione e sacrificio, il progetto ideato assieme ad Antonella Zarletti, prematuramente scomparsa lo scorso anno. Un progetto di vita che sta dando frutti di bellezza, accoglienza e benessere, in uno degli angoli più magici e formidabili dei Monti Sibillini. 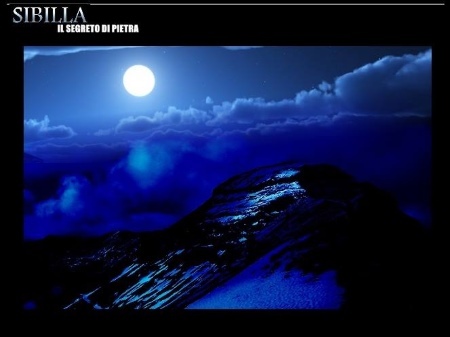 Two special evenings with the enigma of Mount Sibyl: Friday August 17th in Montegallo (Rifugio Agrimusicismo - frazione Astorara) and Saturday August 18th in Montefortino (Agristurismo Santa Lucia dei Sibillini). The ancient books and manuscripts, the explorations, the hope, the tales in the compelling narration and stunning pictures presented by Italian writer Michele Sanvico, the world leading expert in the legend and lore of Mount Sibyl in Italy. 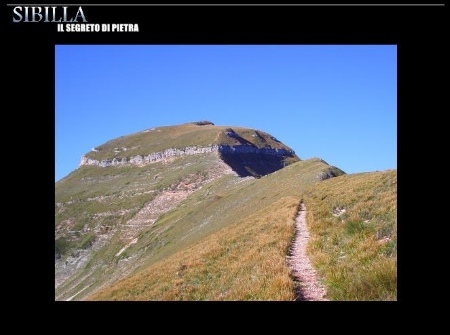 Due serate con l'enigma del Monte della Sibilla: venerdì 17 agosto a Montegallo (Rifugio Agrimusicismo - frazione Astorara) e sabato 18 agosto a Montefortino (Agristurismo Santa Lucia dei Sibillini). Gli antichi testi, le esplorazioni, le speranze, i racconti, nell'appassionante narrazione e nelle spettacolari immagini proposta dallo scrittore Michele Sanvico, uno dei maggiori conoscitori dell'antica leggenda e delle tradizioni connesse al Monte della Sibilla. 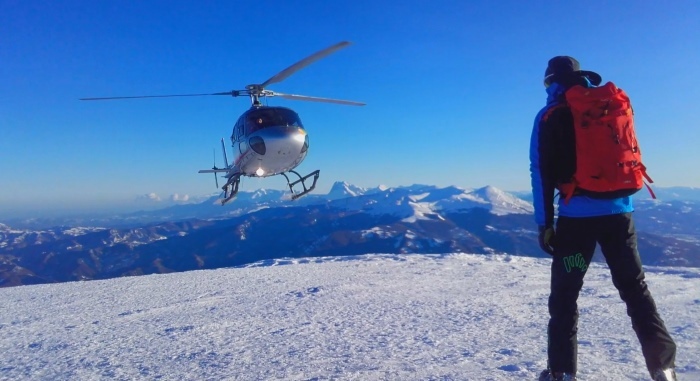 Sydonia Production, a professional motion picture producing company with international reach and presence, will continue to carry out principal photography activities in the Sibillini Mountain Range this summer. 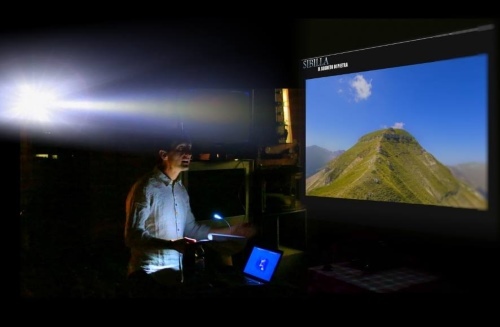 The company is currently dealing with the making of "The Sibyl - Between Legend and Truth", the first docufiction on the legendary tale of the Apennine Sibyl ever filmed. 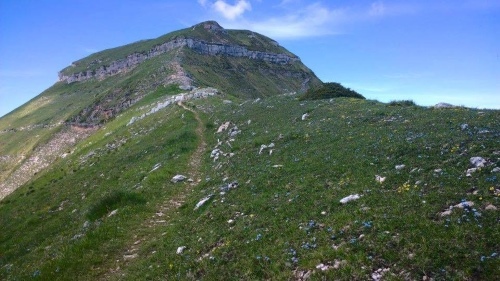 Filming will take place at gorgeous locations closely connected to the sibilline tale and traditions, including Mount Sibyl, the Lakes of Pilatus and the Santuario della Madonna dell'Ambro. Earlier this year, the Sydonia filming crew already brought to completion the shooting of a number of scenes on the Sibyl's mountain-top, featuring drone-supported sequences and reenactment of explorations carried out in past centuries at the magical, mysterious Sibyl's cave. 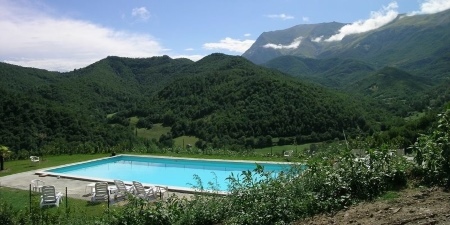 The shooting activity in the Sibillini area will take place in August. 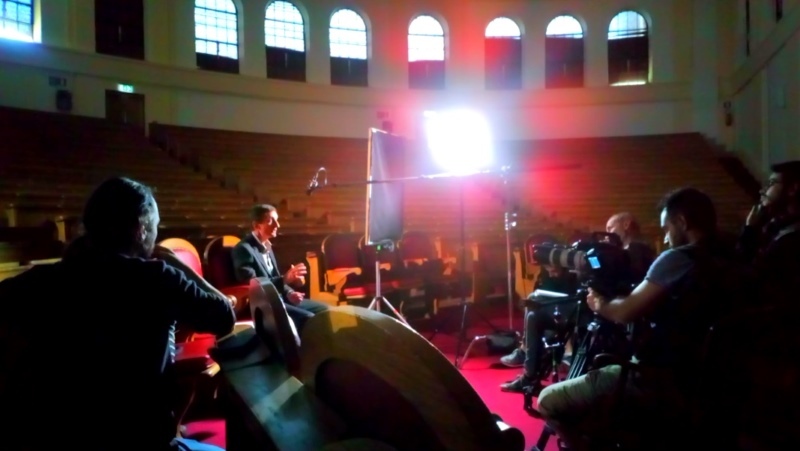 After the completion of the filming phase, Sydonia will proceed with the post-production of the docufiction and prepare for final market launch. With financial support provided by Regione Marche, major broadcasters, local private companies and internal funding, the overall production cost for the project is expected to reach €250,000, a sum that includes the effort for the shooting of historical fiction scenes, which stage costumed actors, a storyboard, specially-built filming sets, and professional lighting, just as in theatrical movies. Sydonia has also launched a crowfunding campaign on https://www.produzionidalbasso.com to raise €21,000 from the general public, with the aim to stir further interest on the project, provide information to a wider audience on the current stage of the docufiction development, and prepare for future promotion. Additional information on Sydonia Production's ongoing project is available on www.produzionidalbasso.com. Sydonia Production, la casa di produzione cinematografica con sede nelle Marche e consolidata presenza sui mercati internazionali, continuerà ad effettuare riprese tra gli spettacolari scenari dei Monti Sibillini nel corso di questa estate. La società è attualmente impegnata nella produzione del documentario "La Sibilla - Tra Realtà e Leggenda", la prima docufiction mai realizzata sul leggendario racconto della Sibilla Appenninica. Le riprese saranno effettuate nei luoghi più affascinanti dei Monti Sibillini, strettamente connessi al racconto e alle tradizioni relative alla Sibilla, come lo stesso Monte Sibilla, i Laghi di Pilato e il Santuario della Madonna dell'Ambro. Nei mesi scorsi, la troupe di Sydonia ha potuto già completare le riprese di una serie di scene ambientate sulla cima della Sibilla, comprendenti anche spettacolari sequenze realizzate con droni e ricostruzioni delle esplorazioni condotte nei secoli passati presso la magica, misteriosissima Grotta della Sibilla. Le attività di ripresa tra i Monti Sibillini avranno luogo nel corso del prossimo mese di agosto. Successivamente, a valle del completamento della fase produttiva, Sydonia procederà con la fase di post-produzione della docufiction e inizierà a predisporre il lancio commerciale del prodotto. Con il sostegno finanziario della Regione Marche, di grandi distributori televisivi, di aziende locali e utilizzando fondi interni, il costo totale di produzione stimato si collocherà attorno ai 250.000 euro, una somma che comprende lo sforzo produttivo necessario per girare le ricostruzioni storiche, le quali vedranno impegnati in scena attori in costume, un vero e proprio storyboard, scenografie opportunamente realizzate e una direzione della fotografia di elevatissima qualità, proprio come accade nel corso della realizzazione di lungometraggi per il cinema. Sydonia ha anche lanciato una campagna di crowfunding su https://www.produzionidalbasso.com con l'obiettivo di raccogliere 21.000 euro da un pubblico più vasto. L'idea è quella di stimolare uno specifico interesse per il progetto, fornire informazioni e aggiornamenti sull'attuale stadio di sviluppo della docufiction e preparare il mercato per la futura promozione del prodotto. Ulteriori informazioni sul progetto in corso di realizzazione da parte di Sydonia Production sono disponibili su www.produzionidalbasso.com. 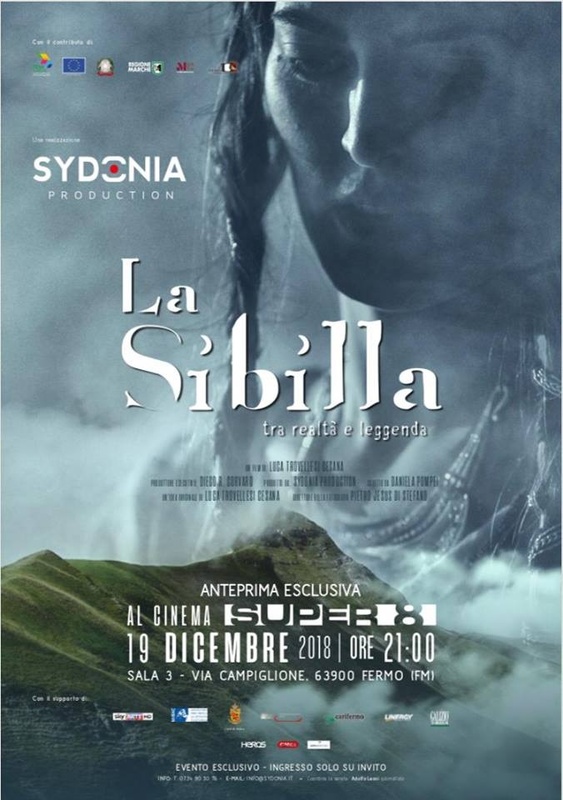 Italy-based Sydonia Entertainment, a professional motion picture producing company with international reach and presence, released the preview of its docufiction "The Sibyl - Between Legend and Truth" dedicated to the Apennine Sibyl. 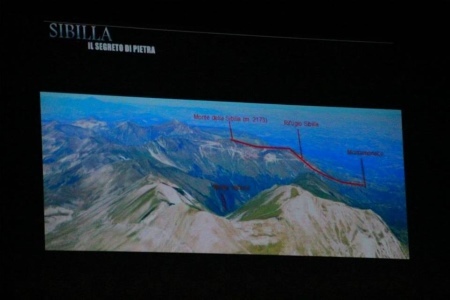 The preview illustrates the magic of the sibilline legendary tale, with astounding drone sequences filmed on Mount Sibyl (Italy) by the Sydonia crew, reenactments of the explorations carried out on the peak in past centuries, and exclusive footage which shows researchers of the University of Camerino performing a technologically advanced geognostic survey on the mountain-top. 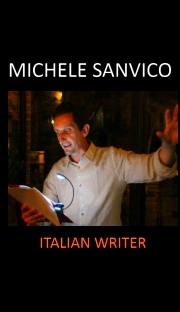 The preview includes passages from an interview with Italian writer Michele Sanvico, the world leading expert in the legend and lore of Mount Sibyl in Italy. 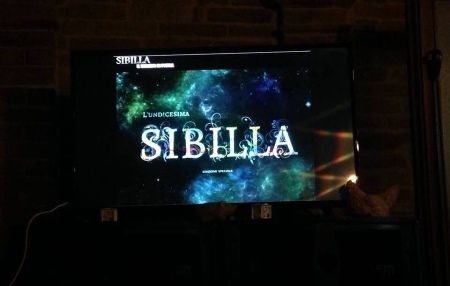 Sydonia Entertainment, la casa di produzione cinematografica con sede nelle Marche e consolidata presenza sui mercati internazionali, ha pubblicato il trailer della docufiction "Sibilla - Tra Realtà e Leggenda", dedicata alla Sibilla Appenninica. L'anteprima illustra la magia del leggendario racconto sibillino, con maestose sequenze aeree originali girate con il drone sul Monte Sibilla, la ricostruzione delle esplorazioni condotte sulla vetta nel corso dei secoli, e immagini esclusive che mostrano i ricercatori dell'Università di Camerino impegnati nell'effettuazione di indagini geognostiche ad elevatissima tecnologia nell'area della Grotta della Sibilla. Il trailer comprende anche brani tratti da un'intervista registrata con lo scrittore Michele Sanvico, uno dei maggiori conoscitori dell'antica leggenda e delle tradizioni connesse al Monte Sibilla. The preliminary footage of the docufiction on the Apennine Sibyl to be produced by Sydonia Entertainement and featuring the Italian writer Michele Sanvico was shot yesterday at an illustrious location near the Quirinal Hill, in downtown Rome. 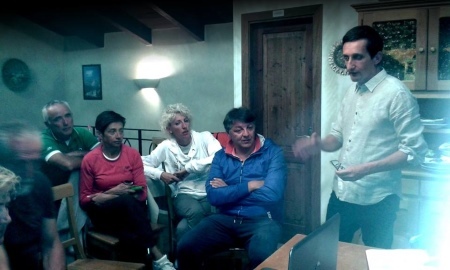 In the pictures and clip: the Sydonia crew led by film director Luca Trovellesi Cesana during the filming of the interview scenes with Michele Sanvico, author of the novel “The Eleventh Sibyl” and manager of the dedicated website “The Apennine Sibyl - A Mystery and a Legend”. The title of the documentary feature will be “The Oracle” and will be ready for international distribution next year. 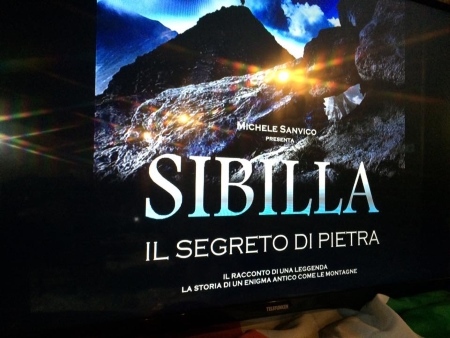 Le riprese preliminari del documentario sulla Sibilla Appenninica che sarà prodotto da Sydonia Entertainement, e nel quale apparirà lo scrittore Michele Sanvico, sono state girate ieri a Roma, presso una prestigiosa location situata in zona Quirinale. Nelle immagini e nella clip: la troupe di Sydonia guidata dal regista Luca Trovellesi Cesana durante le riprese dei segmenti dell'intervista con Michele Sanvico, autore del romanzo “L'Undicesima Sibilla” e gestore del sito dedicato “Sibilla Appenninica - Il Mistero e la Leggenda”. 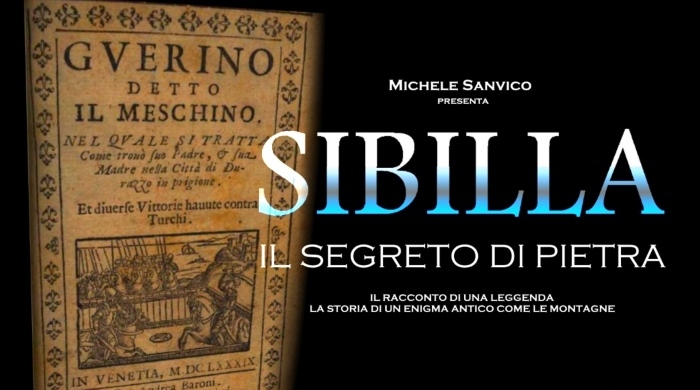 Il documentario si intitolerà “La Sibilla (The Oracle)” e sarà rilasciato per la distribuzione sui mercati internazionali nel corso del prossimo anno. 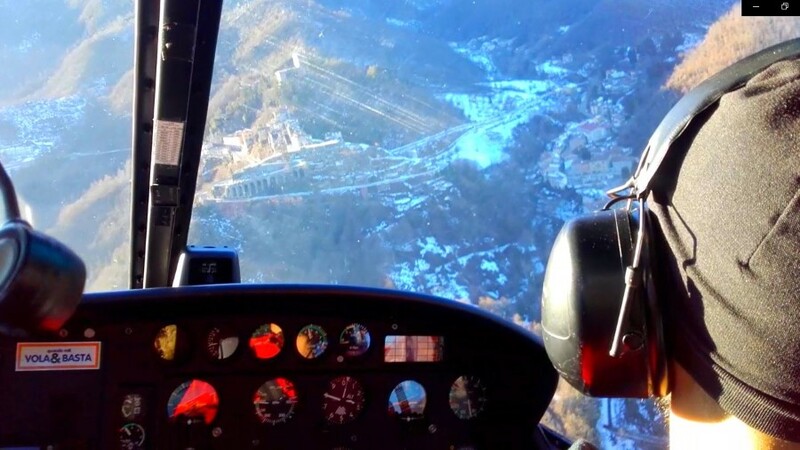 Legend and lore, history and ancient documents, stunning pictures and flights through ravines and precipitous cliffs with 3D animated movies: the Sibillini Mountain Range as you have never seen it before. 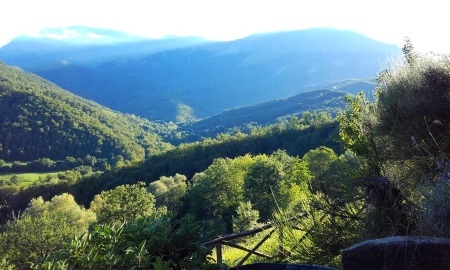 Italian writer Michele Sanvico's new event dedicated to the legend of the Apennine Sibyl was held two days ago at the gorgeous venue of Agriturismo Santa Lucia dei Sibillini in Montefortino (FM), near the very spot where the sibillline myth has been glowing for centuries. The names of Guerrino the Wretch, Antoine de La Sale and Tannhäuser were spoken anew before a riveted audience: a tale that seems to bring together by a single thread the authors of ancient Rome, the references to sibilline oracles in the Apennines dating to the early Middle Age, the sixteenth-century manuscripts depicting the Sibyl's cave and the Lakes of Pilatus, up to the excavations carried out in the twentieth century and the recent high-tech drilling campaigns performed on the Sibyl's mountain-top. History and legend: during the presentation and the subsequent, highly-rewarding panel session with the attendees, a special insight was dedicated to the nature and possible origin of a myth so unique and distinctively marked, in the wake of the baleful occurrence of a destructive earthquake that hit the Sibillini Range with ominous might last year. The many historical references to the previous earthquakes that plagued the land in past centuries greatly impressed the audience, with the same affected territories and the same epicentral spots. Quotes from antique documents were shown during the session, as well as ancient prints and pictures that in some cases had never been shown to the public before: an historical insight not frequently offered to the consideration of residents living in the area. This kind of approach, which originates from a tangible, frightful experience, fosters a new sensibility in the appreciation of the visionary might associated with those mountains since time immemorial, with undeniable links which can be retrieved between the legends that are rooted in the territory - the Apennine Sibyl, the Lakes of Pilatus - and the seismic nature of the same places, where earth and heaven, celestial gods and subterranean deities appear to come together and talk to one another. Leggenda e territorio, storia e documenti antichi, immagini di grandissima suggestione e animazioni tridimensionali in volo tra gole e montagne: i Monti Sibillini come mai sono stati presentati prima d'ora. 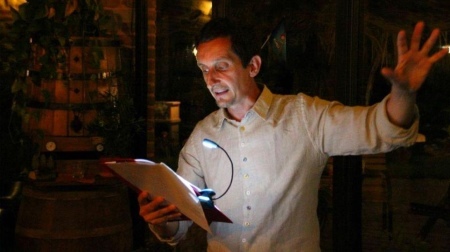 Si è svolta due giorni fa, presso l'incantevole struttura dell'Agriturismo Santa Lucia dei Sibillini di Montefortino (FM), la nuova presentazione tenuta dallo scrittore Michele Sanvico sul mito della Sibilla Appenninica, nei luoghi stessi della leggenda. I nomi di Guerrin Meschino, Antoine de La Sale e Tannhäuser sono risuonati nuovamente di fronte ad un pubblico attento e affascinato: una narrazione che sembra unire con un unico filo i testi di Roma antica, i riferimenti altomedievali alle Sibille nell'Appennino, i manoscritti cinquecenteschi raffiguranti la Grotta della Sibilla e i Laghi di Pilato, fino ad arrivare agli scavi del secolo scorso e alle più avanzate campagne di esplorazione condotte negli ultimi anni sulla cima del Monte Sibilla. Storia e mito: grande risalto è stato dato, anche nel successivo, ricchissimo scambio di idee con i presenti, al tema della natura e delle possibili origini di una leggenda così peculiare, alla luce di un'esperienza umana dolorosa e terribile come quella del recente terremoto, che proprio tra i Monti Sibillini ha esplicato la sua massima potenza distruttrice. Impressionanti sono apparsi i molteplici riferimenti storici ai precedenti terremoti che hanno colpito, nei secoli passati, le medesime zone, con i medesimi epicentri, documentati nel corso della presentazione con citazioni tratte da documenti antichi e immagini d'epoca, in alcuni casi mai presentate al pubblico in precedenza. Uno sguardo storico raramente proposto all'attenzione di coloro che abitano in questi territori, che permette anche di valutare oggi, nella sua drammatica, tangibile realtà, tutta la potenza mitica ed immaginativa associata sin dall'antichità a queste montagne, con legami indubitabilmente sussistenti tra le leggende che abitano queste terre - la Sibilla Appenninica, i Laghi di Pilato - e la natura sismica di luoghi dove terra e cielo, divinità celesti ed infere sembrano incontrarsi e parlarsi. Mount Sibyl - A Secret of Stone. The tale of a legend. The story of a riddle as old as the Sibillini Mountain Range. 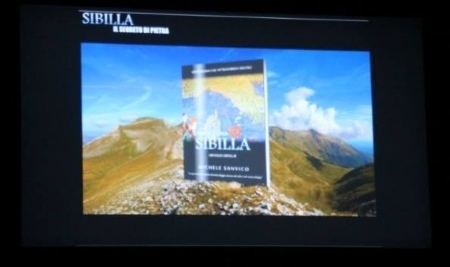 The Apennine Sibyl narrated by Italian writer Michele Sanvico. 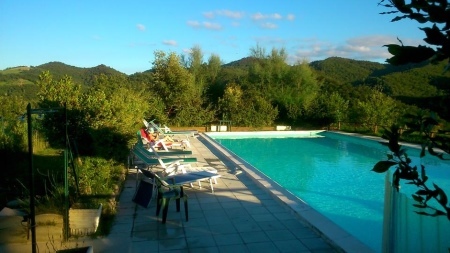 Saturday August 19th 2017 - Agriturismo Santa Lucia dei Sibillini - Fraz. S. Lucia - Montefortino (FM). Sibilla - Il Segreto di Pietra. Il racconto di una leggenda. La storia di un enigma antico come le montagne. 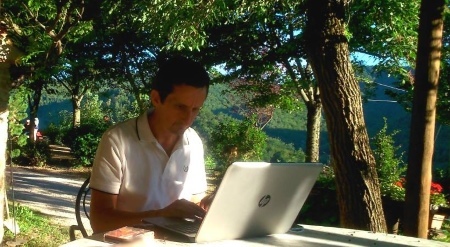 La Sibilla Appenninica narrata dallo scrittore Michele Sanvico. Sabato 19 Agosto 2017 - Agriturismo Santa Lucia dei Sibillini - Fraz. S. Lucia - Montefortino (FM). Adding the final touch to the "Mount Sibyl - A Secret of Stone" presentation on Aug, 13th 2016 at the gorgeous Agriturismo "La Cittadella dei Sibillini" in Montemonaco. No earthquake and no enraged Sibyl can ever spoil the beauty of a place like this. 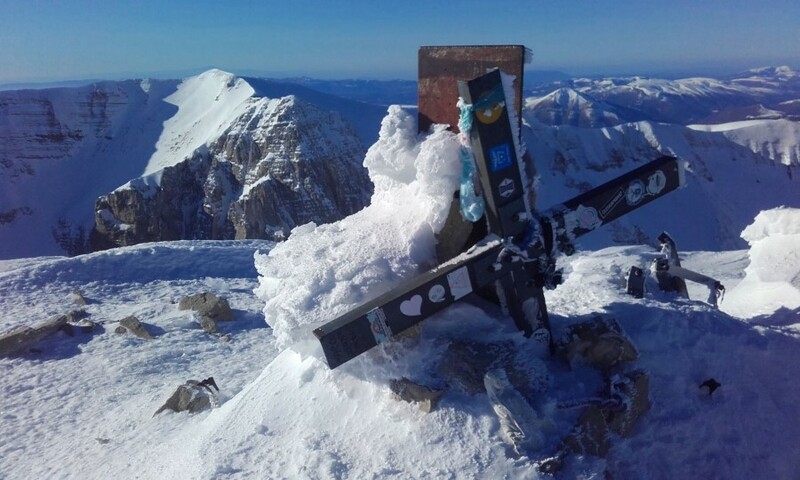 Beauty and people of the Sibillini Range are stronger! 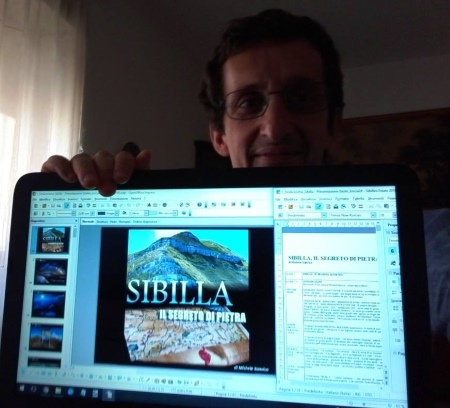 Apportando gli ultimi tocchi alla presentazione “Sibilla – Il Segreto di Pietra” che si sarebbe tenuta il 13 agosto 2016 presso il meraviglioso Agriturismo “La Cittadella dei Sibillini” di Montemonaco. Nessun terremoto e nessuna irata Sibilla potrà mai rovinare la bellezza di un posto come questo. La bellezza di questi luoghi e la gente dei Sibillini saranno sempre più forti! The most rewarding prize for an author is to win the hearts and minds of a distinguished audience, and to get strong emotional feelings in return. 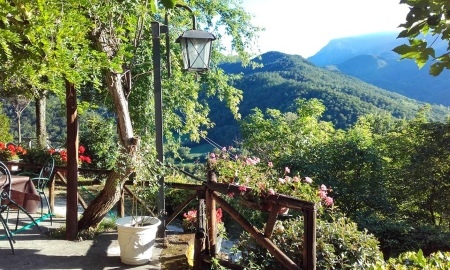 That's what happened yesterday at the most charming Agriturismo "S. Lucia dei Sibillini" in Montefortino, set in a bewitching location facing Mount Sibyl's peak. The legendary story of the Apennine Sibyl was told anew. People was thrilled and moved by the tale. And your writer experienced once again that what you deliver to people is much less than what you get back from them: not only warm appreciation (a writer always likes this! 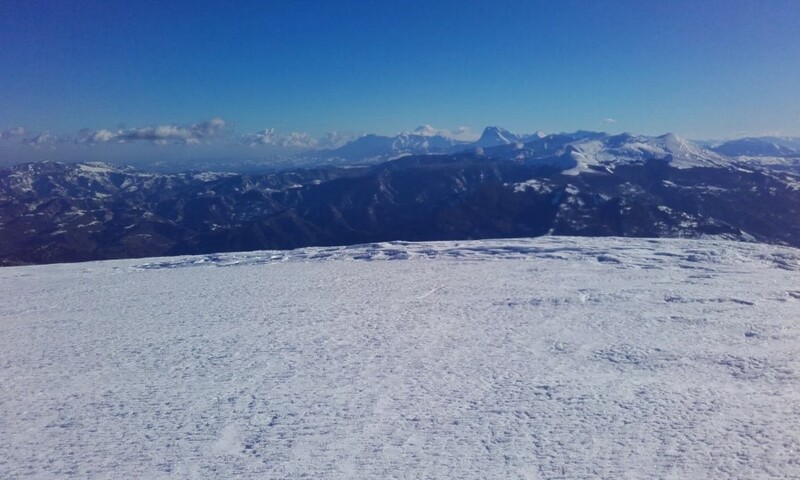 ), but also waves of crystal-clear emotion - so much so that at the end of yesterday's session my head was almost filled with a sense of dizziness, as if following a long, exhausting, unforgettable walk up a vertiginous ridge leading to a breathtaking vista over the Sibillini Range. I wish to thank all the brave and interested attendees, who were really nice to me; Federico and Nicoletta of SibilliniWeb for their loving friendship and unceasing flow of positive energy (providing me with brand new strength each time we meet), and Francesco and Bernardina of Agriturismo "S. Lucia dei Sibillini", whose radiant smiles, caring hearts and love for their work I will treasure for life, and so will my wife Silvia. Il premio più ambìto per uno scrittore è quello di vincere i cuori e le menti di un pubblico selezionato, ottenendo come ricompensa intensissimi flussi di emozione. 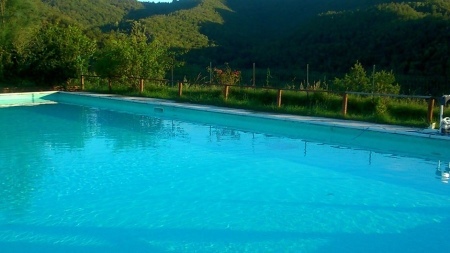 Questo è ciò che è accaduto il 20 agosto 2016 presso il bellissimo agriturismo “S. Lucia dei Sibillini” a Montefortino, posto in una posizione mozzafiato proprio di fronte al Monte Sibilla. La storia leggendaria della Sibilla è stata raccontata di nuovo. Il pubblico ha potuto sperimentare tutto il brivido e l'intensità del la narrazione. E il vostro scrittore ha potuto riscoprire, ancora una volta, che ciò che viene distribuito è molto meno di ciò che torna indietro alla fonte: non solo una calda accoglienza (e questo è proprio ciò di cui uno scrittore è in cerca!) ma anche onde di emozione cristallina – tanto che al termine della presentazione il mio cuore era ricolmo di un senso di vertigine, come dopo una lunga, esaltante ed indimenticabile escursione lungo i crinali aerei che si snodano attraverso i panorami meravigliosi dei Monti Sibillini. 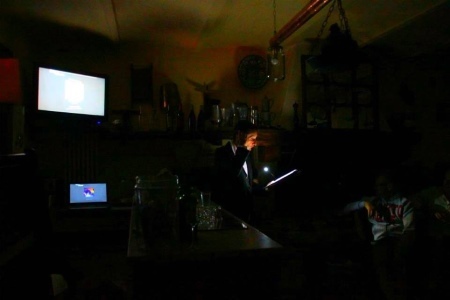 Ho ringraziato i coraggiosi e interessati partecipanti, tutti estremamente gentili con lo speaker; e poi Federico e Nicoletta di SibilliniWeb per la loro sincera amicizia e per il flusso ininterrotto di energia positiva che da loro si promana (una vera e propria ricarica per il sottoscritto); e infine Francesco e Bernardina dell'Agriturismo “S. Lucia dei Sibillini”, dei quali io e mia moglie Silvia porteremo sempre nei cuori i sorrisi contagiosi, gli animi sinceri e l'amore per il loro bellissimo lavoro. 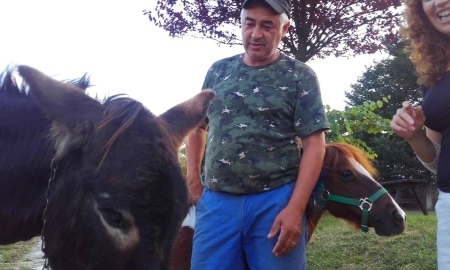 Friendship and farm animals at the "S. Maria dei Sibillini"
Yesterday at Agriturismo "S. Lucia dei Sibillini" in Montefortino: owner and manager Francesco Molinari entertains his guests with friendly, soft-haired farmhouse animals. 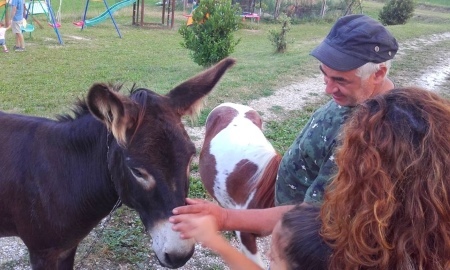 Amicizia e animali da cortile al "S. Maria dei Sibillini"
Agriturismo “S. 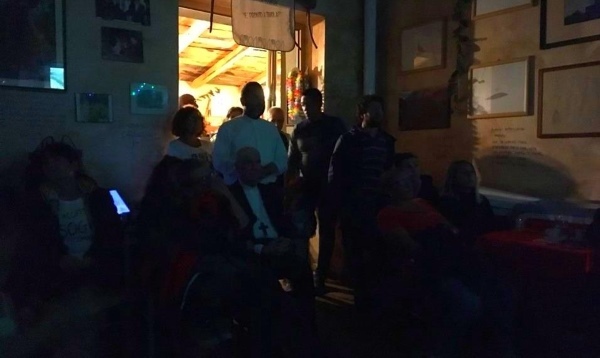 Lucia dei Sibillini” a Montefortino: il proprietario e gestore Francesco Molinari delizia i suoi ospiti con simpaticissimi animali da fattoria dal pelo soffice. 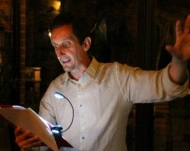 Michele Sanvico narrates the legend of the Apennine Sibyl at the agriturismo "Santa Lucia dei Sibillini" in Montefortino. 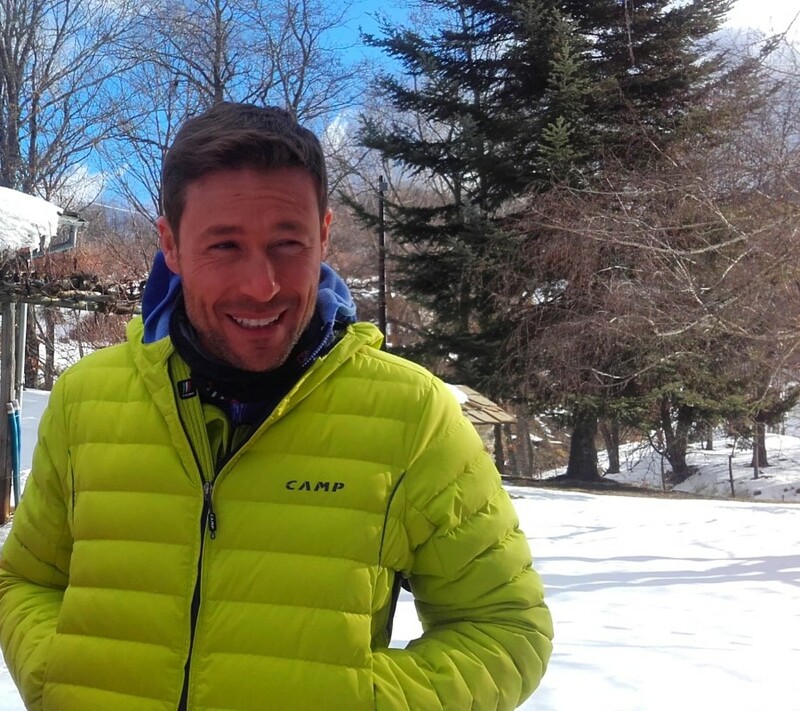 Michele Sanvico racconta la leggenda della Sibilla Appenninica all'agriturismo "Santa Lucia dei Sibillini" di Montefortino. The 2016 edition of the event "Mount Sibyl - A Secret of Stone" delivers fresh emotion each time it is staged again at a new location. 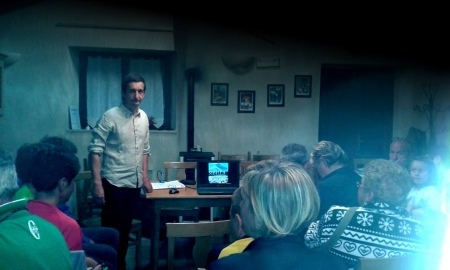 That is what happened yesterday at the Rifugio Altino in Montemonaco: people have been listening attentively to the enthralling story narrated bythe Italian writer Michele Sanvico, without saying a word, and making no move. All sleeping on their chairs? Not at all! 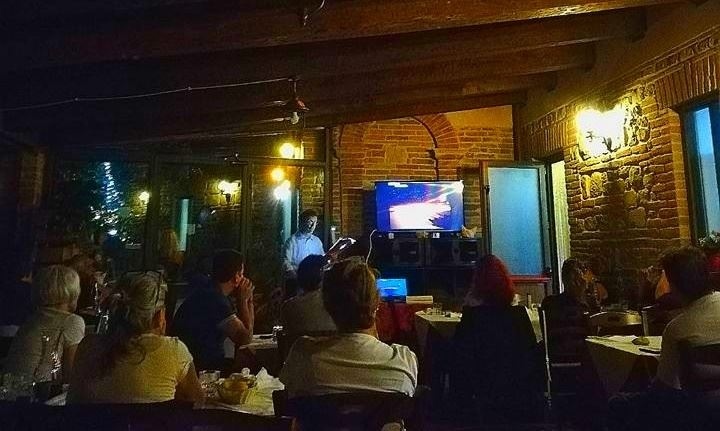 Attendees' eyes were eagerly riveted to the gripping sequence of slides, all minds were thoroughly absorbed into the words retracing the history of a legend, all hands seemed to be willing to clutch a spade and go right away up there to dig the mystery out of that reluctant cave. 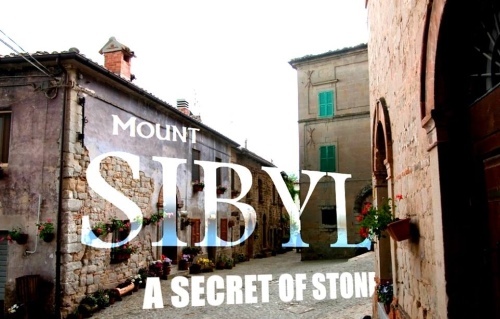 This is the power of "Mount Sibyl - A Secret of Stone": a magical experience of storytelling you will remember forever. 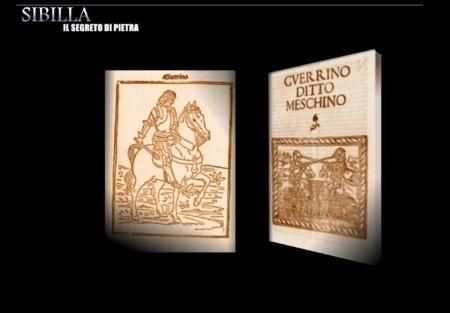 L'edizione 2016 dell'evento “Sibilla – Il Segreto di Pietra” produce nuove emozioni ogni volta che essa è posta in scena in una nuova località. 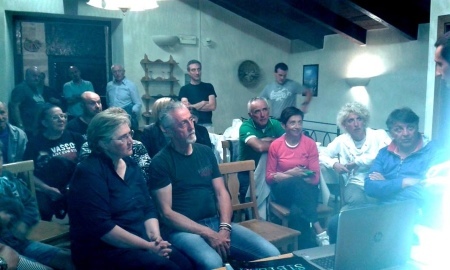 Questo è esattamente ciò che è accaduto il 17 agosto 2016 presso il Rifugio Altino di Montemonaco: il pubblico ha ascoltato attentamente l'affascinante narrazione proposta dallo scrittore Michele Sanvico, quasi immobilizzato sulle proprie sedie e senza pronunciare parola. Tutti addormentati? Affatto! I presenti sono stati completamente assorbiti dalla magica sequenza di immagini, i pensieri catturati dalle parole che ripercorrevano la storia di una leggenda. Tutte le mani parevano volere impugnare subito un piccone, per recarsi immediatamente lassù e scavare attorno all'ingresso della grotta, per risolvere finalmente il mistero. È questo il potere di “Sibilla – Il Segreto di Pietra”: un'esperienza narrativa unica, che ricorderete per sempre. 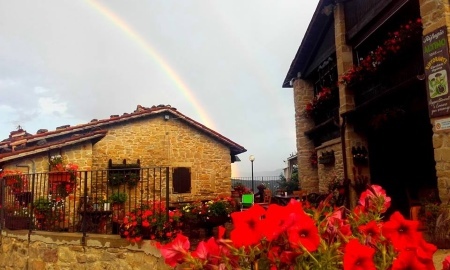 Rifugio Altino in Montemonaco: a welcoming rainbow from Mount Sibyl, looming over the tiny hamlet of Altino. Rifugio Altino di Montemonaco: arcobaleno sul Monte Sibilla, che incombe sopra il piccolo villaggio di Altino. See you tonight in Altino for the real Sibyl's experience! 17 agosto 2016: la leggenda della Sibilla Appenninica ad Altino di Montemonaco. Another encounter with the Apennine Sibyl's legend at a most delightful location: the Rifugio Altino in Montemonaco, August 17th 2016, 21:30. 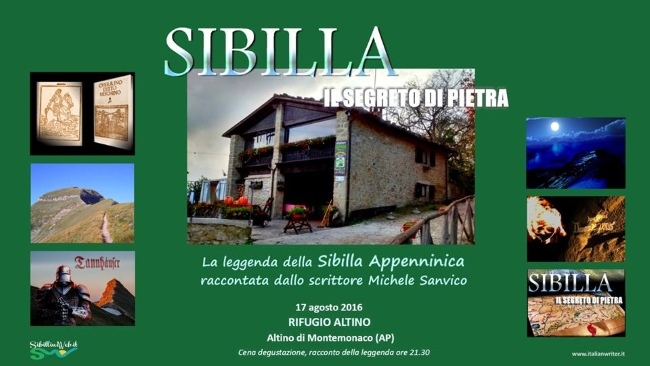 Il 17 agosto 2016, si è tenuto un nuovo incontro con la leggenda della Sibilla Appenninica presso il Rifugio Altino di Montemonaco. 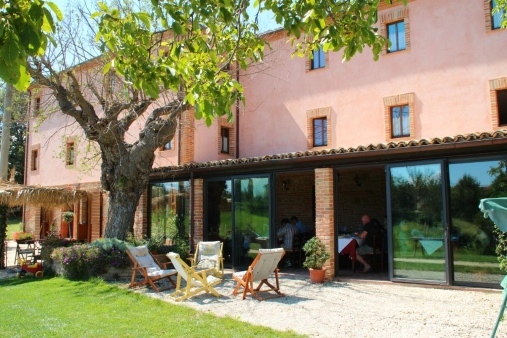 The spirit of the Sibyl lingered yesterday over the superb location of the Agriturismo "La Cittadella dei Sibillini". Among the Apennine ridges lit by the setting sun, in a valley covered with charming woods, just beneath Mount Sibyl's peak, a selected audience including lovers of local legend and lore played a sort of Indiana Jones-like search amid the clues that the Sibyl has scattered across many centuries, concealing in secrecy her origin and present dwelling. Author Michele Sanvico led the participants into a maze of literary quotes, adventurers' chronicles and scientific reports, a veritable full-immersion experience based on astoundingly beautiful images of Mount Sibyl, unique flight sequences over and through the Sibillini Mountain Range crests and reading excerpts from "Guerrino the Wretch" and other works. "I've never attended nothing like this, it's an utterly moving experience for people who love the Sibyl's legend" said one of the attendees. "As a writer, you have succeeded in conveying all the emotional thrill that vibrates behind the thousand-year-long quest for the Apennine Sibyl", another participant declared. The next performance replica of "Mount Sibyl - A Secret of Stone" will be staged on Wednesday, August 17th at Rifugio Altino in Montemonaco: once again, under Mount Sibyl's shadow and queenly crown. Il 13 agosto 2016, lo spirito della Sibilla ha aleggiato sulla superba località dove è situato l'Agriturismo “La Cittadella dei Sibillini”, nei pressi di Montemonaco. Tra le creste degli Appennini illuminate dal sole calante, in una vallata ricoperta da boschi ombrosi, proprio al di sotto del picco del Monte Sibilla, un pubblico attento, composto da appassionati delle leggende e delle tradizioni locali, ha giocato una sorta di ricerca al modo di Indiana Jones tra gli indizi che la Sibilla ha sparso lungo molti secoli, nascondendo sotto un velo di mistero le proprie origini e il proprio magico regno. Lo scrittore Michele Sanvico ha condotto i partecipanti attraverso un labirinto di citazioni letterarie, cronache di esploratori e relazioni scientifiche, una vera immersione totale nel mistero con l'aiuto di immagini meravigliose del Monte Sibilla, sequenze uniche e affascinanti in volo sopra e attraverso le creste dei Monti Sibillini, e letture di brani estratti da “Guerrin Meschino” e altre opere letterarie. “Non ho mai partecipato in precedenza a nulla di simile, è un esperienza del tutto coinvolgente per coloro che sono affascinati dalla leggenda della Sibilla”, ha dichiarato uno dei partecipanti. “Come scrittore, Sanvico è riuscito a trasmettere al pubblico tutta l'emozione che vibra nella millenaria ricerca della verità sulla Sibilla Appenninica”, ha dichiarato un altro spettatore. La successiva replica di “Sibilla – Il Segreto di Pietra” è stata posta in scena il giorno 17 agosto 2016 presso il Rifugio Altino di Montemonaco: ancora una volta, all'ombra del Monte della Sibilla e della sua corona regale di pietra. Mount Sibyl as seen from "La Cittadella dei Sibillini". Il Monte Sibilla visto dall'agriturismo “La Cittadella dei Sibillini” di Montemonaco. 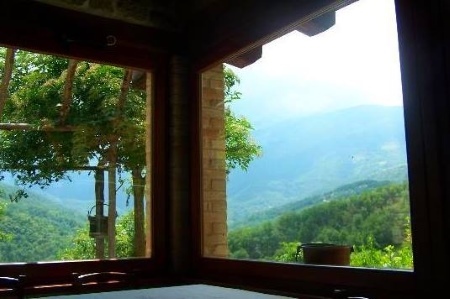 Arrival to the Agriturismo "La Cittadella dei Sibillini", a magical place set in a gorgeous natural landscape. Arrivo all'agriturismo “La Cittadella dei Sibillini” a Montemonaco. Un luogo magico immerso in un panorama unico. 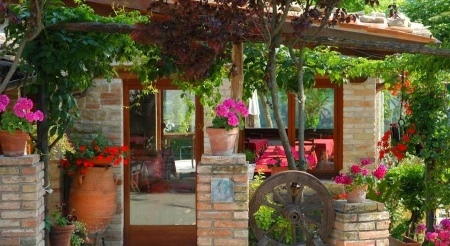 And - by the way - look at what is waiting for you tonight at the Agriturismo La Cittadella dei Sibillini in Montemonaco... Perfect bliss, friends! 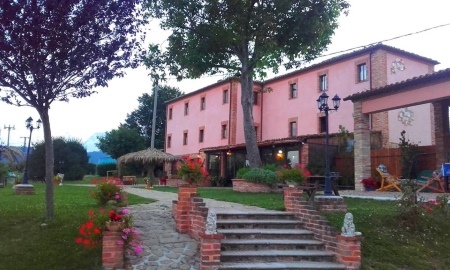 L'Agriturismo “La Cittadella dei Sibillini” a Montemonaco. 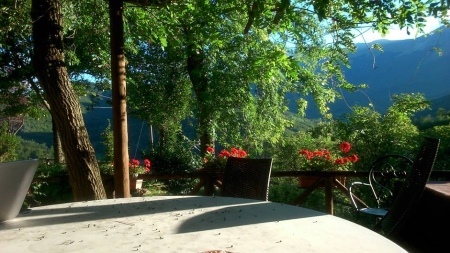 The Apennine Sibyl, a cavern, a mountain, a mystery: the time has come for you to meet the legend at the Agriturismo La Cittadella dei Sibillini in Montemonaco. An evening you won't forget. 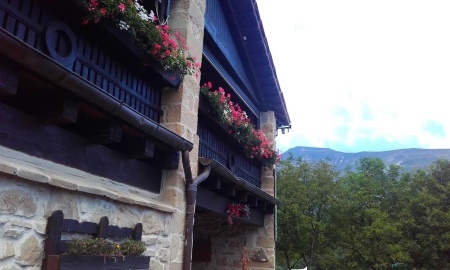 La Sibilla Appenninica, una grotta, una montagna, un mistero: “Sibilla – Il Segreto di Pietra” all'Agriturismo “La Cittadella dei Sibillini” a Montemonaco. "My desire for knowledge about Mount Sibyl's legend and lore is strong. I crave for additional information on the Apennine Sibyl, and yet even local people seem to know anything about all that. What can I do?" 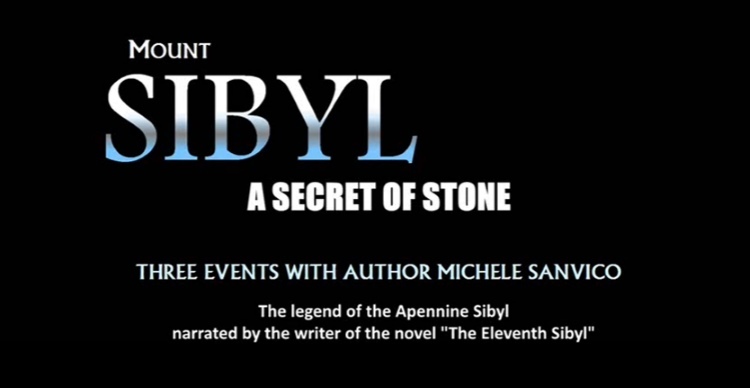 Join Italian writer Michele Sanvico in Montemonaco and Montefortino on August 13th, 17th and 20th for the "Mount Sibyl - A Secret of Stone" events. Experience the mystery and thrill of the Sibyl's legend in a way you have never experienced before. 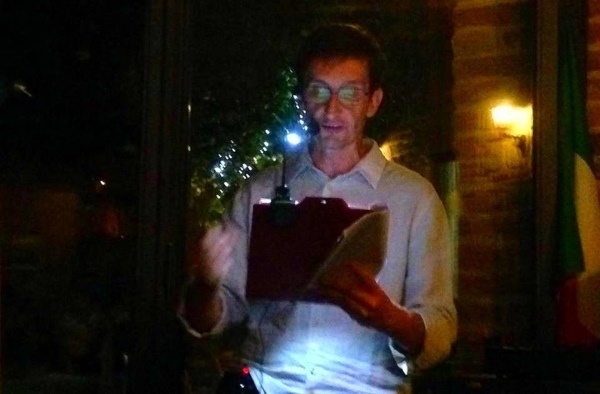 Partecipa alle presentazioni tenute dallo scrittore Michele Sanvico sul tema: “Sibilla – Il Segreto di Pietra”. Potrai così vivere tutto il mistero e la fascinazione della leggenda sibillina. Un'esperienza che non dimenticherai. 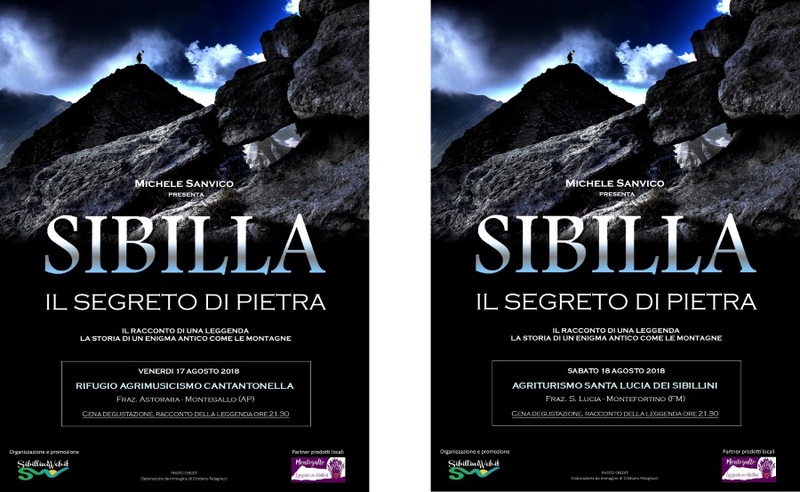 MOUNT SIBYL, A SECRET OF STONE - The Apennine Sibyl's dream will take new life on Saturday August, 13th with the compelling narrative and charming images presented by Italian writer Michele Sanvico at the Agriturismo "La Cittadella dei Sibillini" in Montemonaco. A ride through history and legend, an enthralling journey you will never forget. 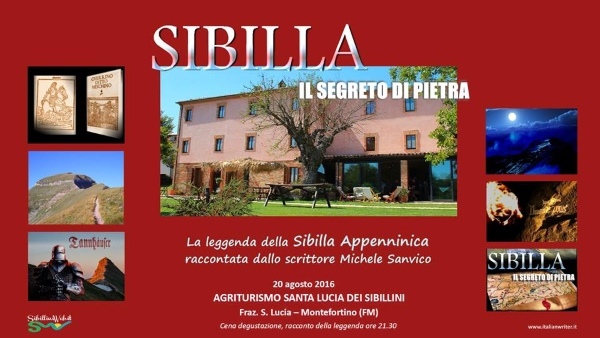 SIBILLA, IL SEGRETO DI PIETRA - Il sogno della Sibilla Appenninica ha preso nuova vita sabato 13 agosto 2016 con l'incalzante narrazione e le affascinanti immagini presentate dallo scrittore Michele Sanvico presso l'Agriturismo “La Cittadella dei Sibillini” a Montemonaco: una cavalcata attraverso storia e leggenda, un viaggio incredibile che sarà difficile dimenticare. Time of the Apennine Sibyl has finally come... See you in Montemonaco and Montefortino on August 13th, 17th and 20th. Meet the legendary tale. Discover "A Secret of Stone". 13, 17 e 20 agosto 2016: tre serate per conoscere la leggenda del Monte Sibilla. 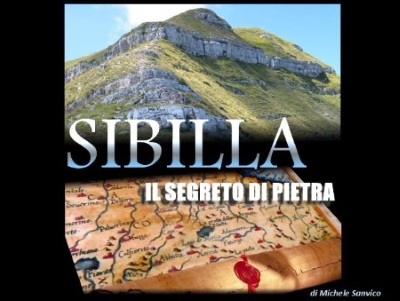 La presentazione “Sibilla – Il Segreto di Pietra” a Montemonaco e Montefortino. Qual è il segreto del Monte della Sibilla? Perché questa montagna è stata così famosa in tutta Europa? Esiste veramente una grotta sulla cima? È ancora possibile entrare in quella caverna? Perché così tanti visitatori erano soliti recarsi negli scorsi secoli fino a questi picchi dei Monti Sibillini? Queste ed altre domande trovano una risposta nella presentazione dello scrittore Michele Sanvico “Sibilla – Il Segreto di Pietra”, che è stata replicata a Montemonaco e Montefortino il 13, 17 e 20 agosto 2016. Un sogno magico, lungo più di duemila anni. 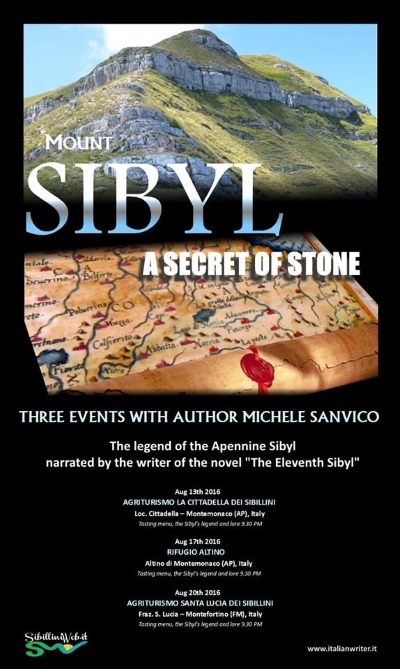 Mount Sibyl, a Secret of Stone: a riveting tale which will be told by Italian writer Michele Sanvico on August, 13th, 17th and 20th in three selected locations in the Sibillini Mountain Range, Italy. Three multimedia events to fully experience the fascination of a thrilling Italian enigma, a mystery unwinding its legendary spell through twenty centuries from Roman times to our present days. Sibilla, il Segreto di Pietra: un racconto entusiasmante che è stato raccontato dallo scrittore Michele Sanvico nelle giornate del 13, 17 e 20 agosto 2016 in tre località dei Monti Sibillini. Si è trattato di tre eventi multimediali che hanno permesso al pubblico di vivere il fascino di questo incredibile enigma, un mistero che dispiega il proprio fascino leggendario attraverso venti secoli, dal tempo dei Romani fino ai giorni nostri. The first of the three events to be held in Montemonaco at Agriturismo La Cittadella on August, 13th 2016. La prima delle tre presentazioni sarà tenuta in Montemonaco il 13 agosto 2016 presso l'Agriturismo La Cittadella. 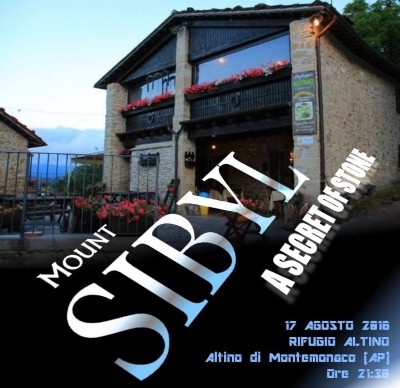 The presentation "Mount Sibyl - A Secret of Stone" will be held in the picturesque hamlets of Montemonaco (August 13th at Agriturismo La Cittadella and August 17th at Rifugio Altino) and Montefortino (August 20th at Agriturismo Santa Lucia dei Sibillini). The event will be delivered in the Italian language. However, the presentation may be re-staged on request in English for selected audiences on an additional date. 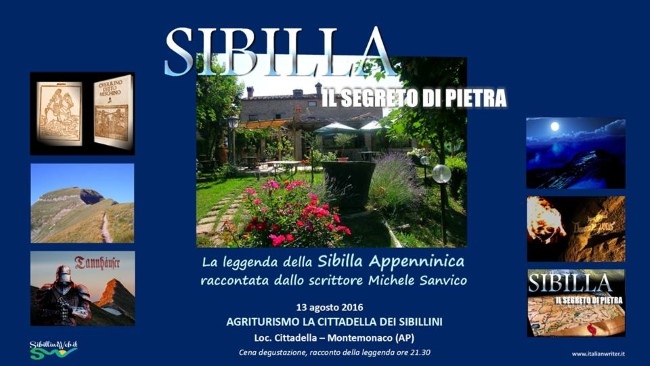 La presentazione “Sibilla – Il Segreto di Pietra” è stata tenuta nelle bellissime località di Montemonaco (13 agosto 2016, Agriturismo La Cittadella e 17 agosto 2016, Rifugio Altino) e Montefortino (20 agosto 2016, Agriturismo Santa Lucia dei Sibillini). Currently editing the three slide presentations on the Sibyl's legend to be held in Montemonaco and Montefortino (Italy) in mid-August. Hard work but plenty of fun! And lots of special effects too, with extensive use of GoogleEarth flythroughs. 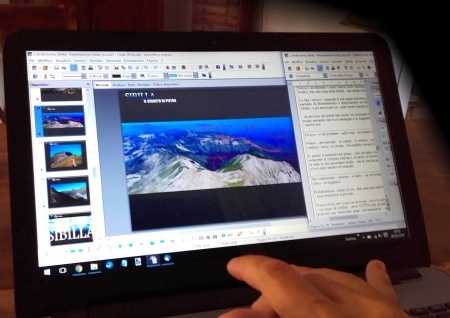 Preparazione delle slides per le tre presentazioni sulla leggenda della Sibilla che si sarebbero tenute a Montemonaco e Montefortino a metà agosto. Un lavoro duro ma estremamente divertente, con molti effetti speciali e un uso esteso delle visualizzazioni GoogleEarth. A 45-second trailer of the three events "Mount Sibyl - A Secret of Stone" to be staged in selected Italian locations by author Michele Sanvico in Aug, 2016. Un trailer lungo 45 secondi relativo alle tre serate "Sibilla - Il Segreto di Pietra" che saranno tenute dallo scrittore Michele Sanvico in tre diverse località ad Agosto 2016. A tale rich in magical shades told by a knowledgeable expert in Italian legends and lore. Three riveting events devoted to the myth of the Sibyl, staged at the very locations where the tradition still lives on. 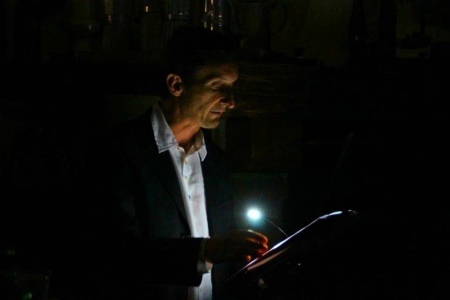 Italian writer Michele Sanvico, author of the novel "The Eleventh Sibyl", will captivate an attentive audience with the narration of the tale of the Sibyl's cave, the gloomy hollow that is situated on Mount Sibyl's peak in Italy. Tre serate per ascoltare e rivivere una storia antica e misteriosa: quella della Sibilla Appenninica, un mito che per secoli ha attirato viaggiatori, esploratori e avventurieri tra le montagne incantate dei Sibillini. Un racconto ricco di magia, narrato da un esperto conoscitore della leggenda. Tre coinvolgenti serate dedicate al mito della Sibilla, proposte nei luoghi stessi dove la tradizione è ancora viva. 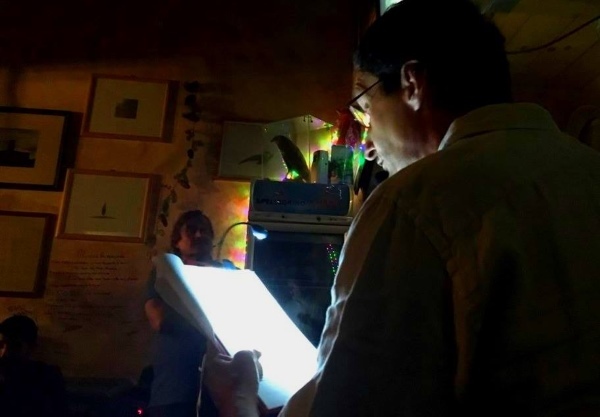 Sarà lo scrittore Michele Sanvico, autore del romanzo "L'Undicesima Sibilla", ad affascinare nuovamente il pubblico con l'illustrazione della storia della Grotta della Sibilla, l'antro oscuro che si apre sulla cima del Monte Sibilla.